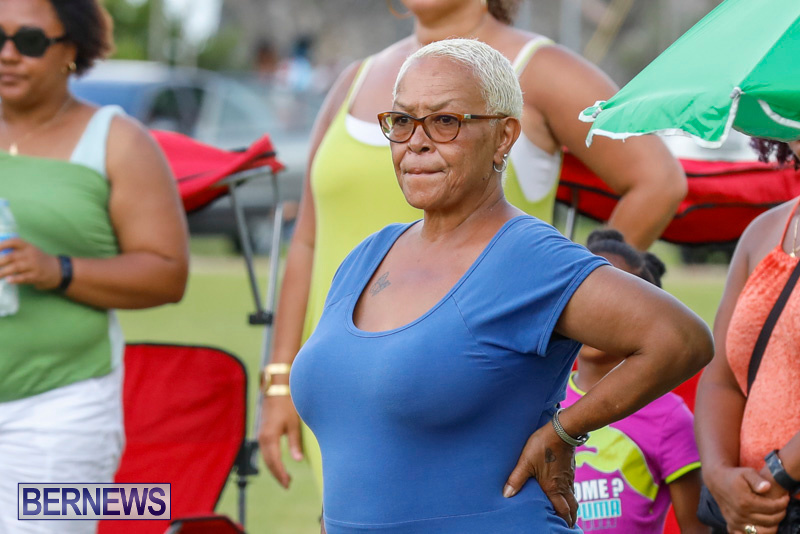 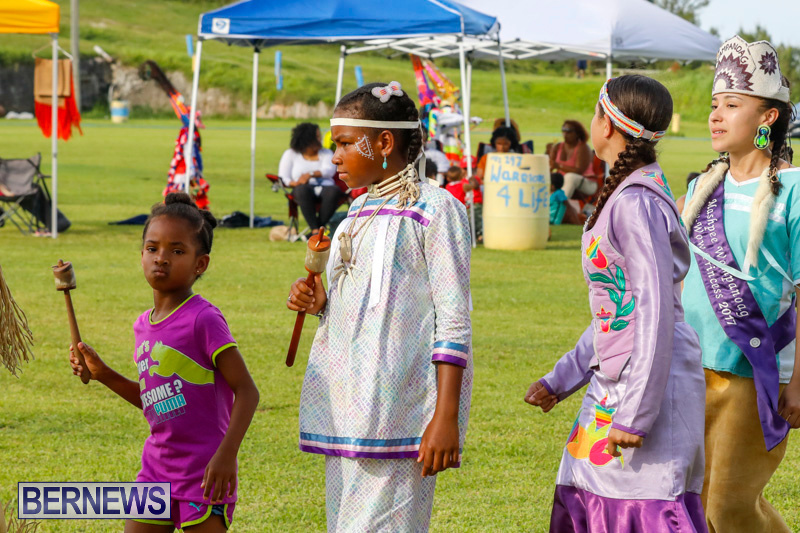 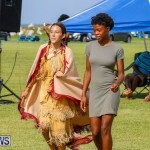 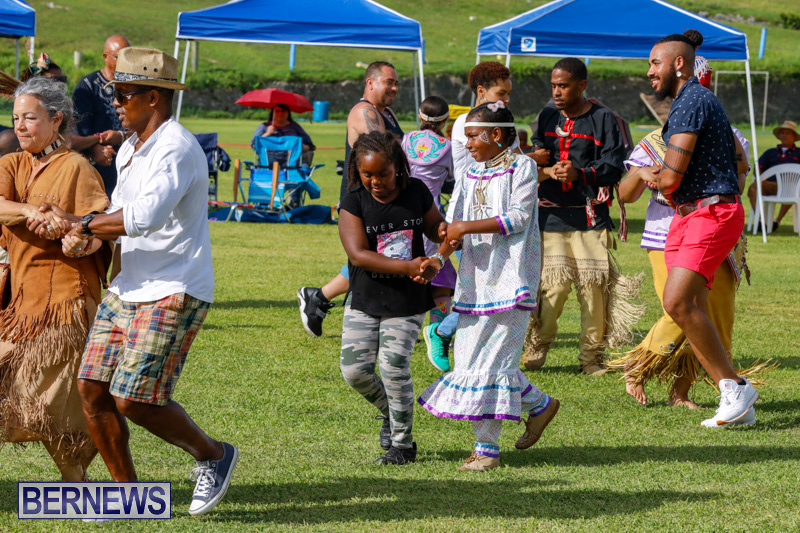 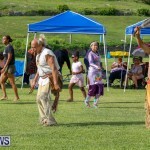 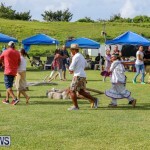 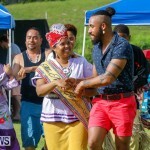 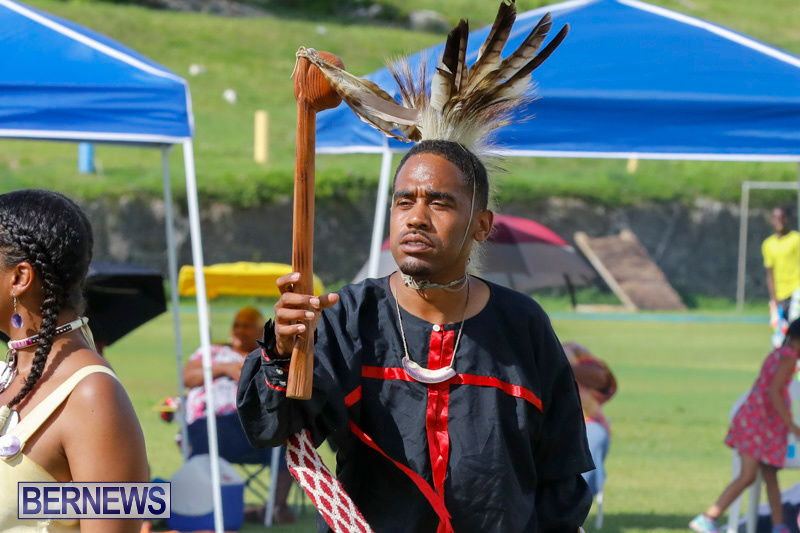 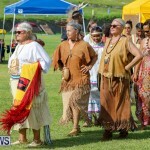 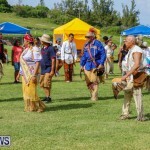 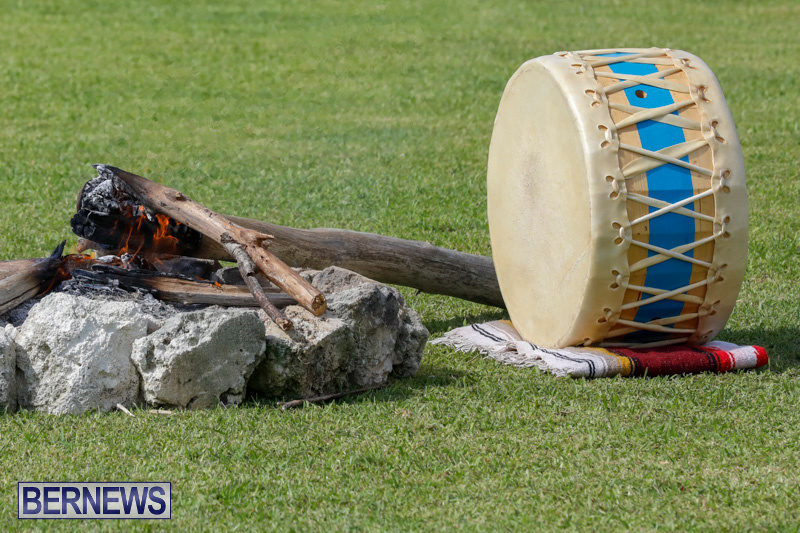 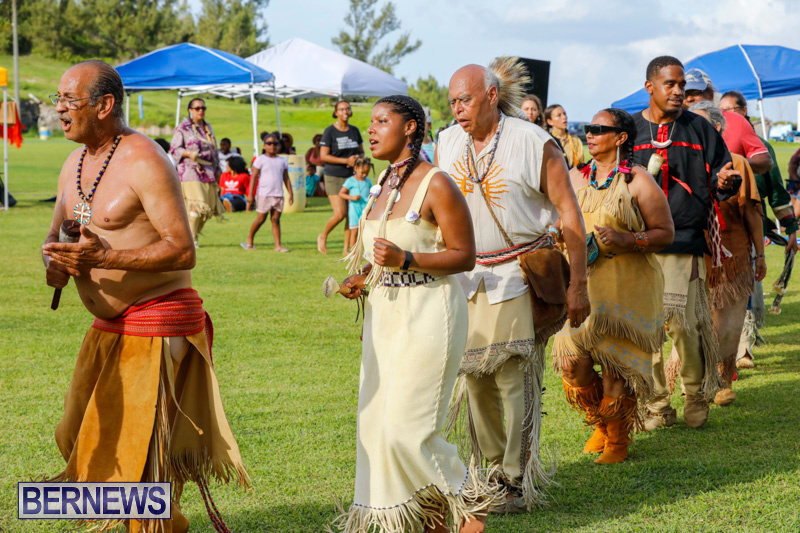 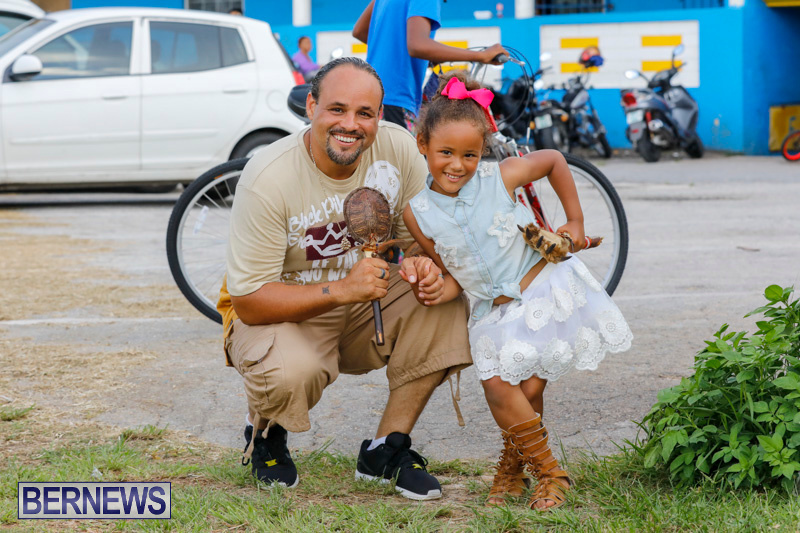 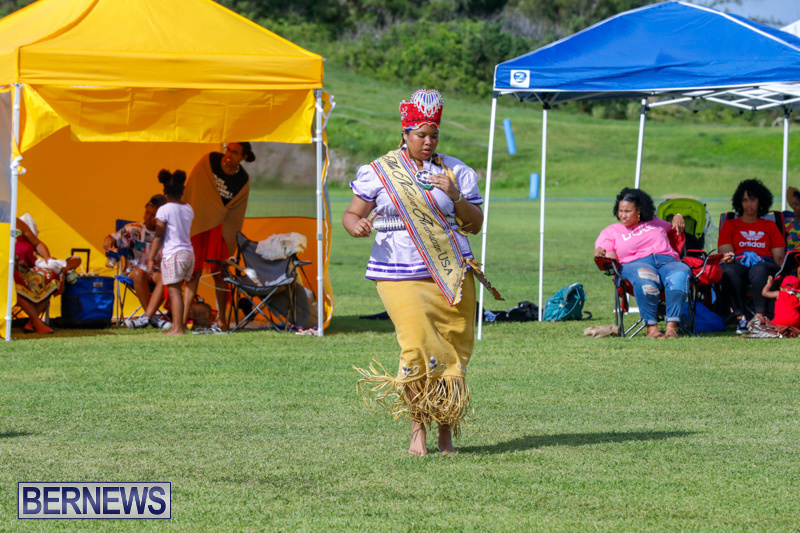 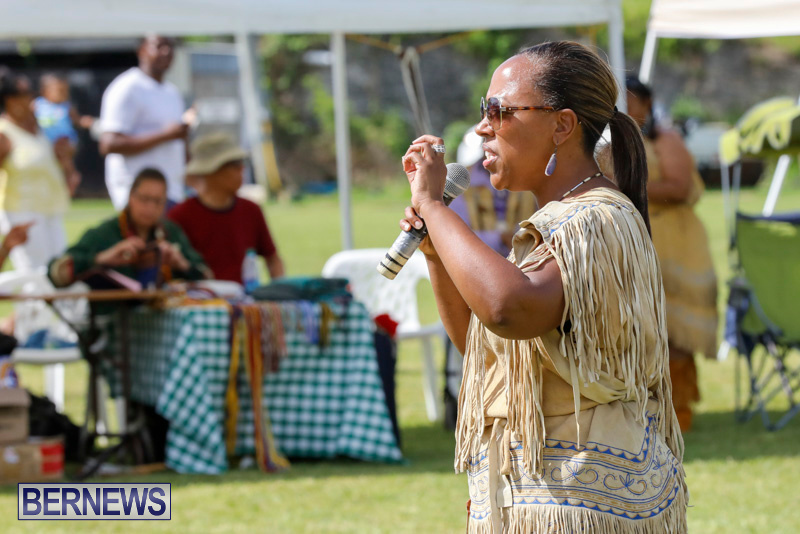 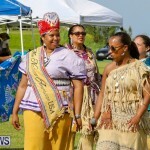 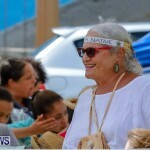 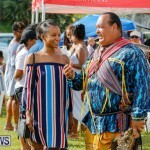 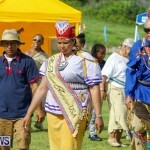 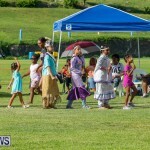 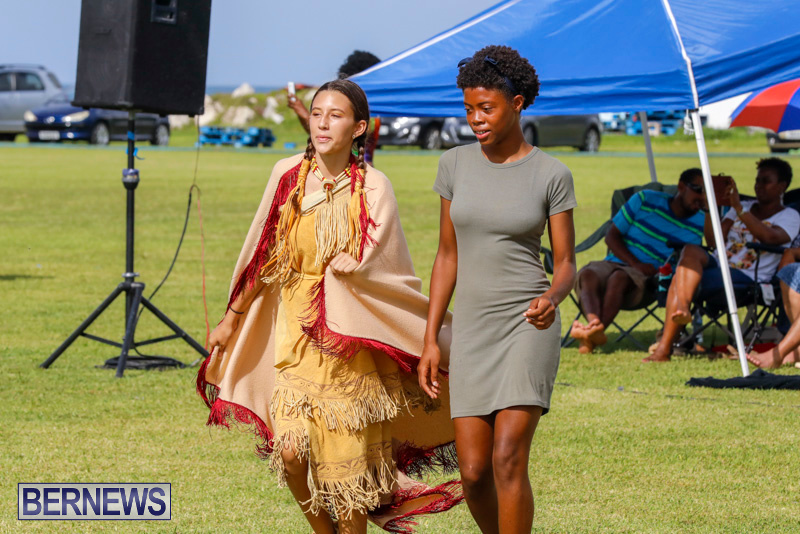 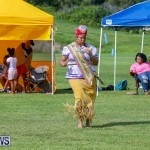 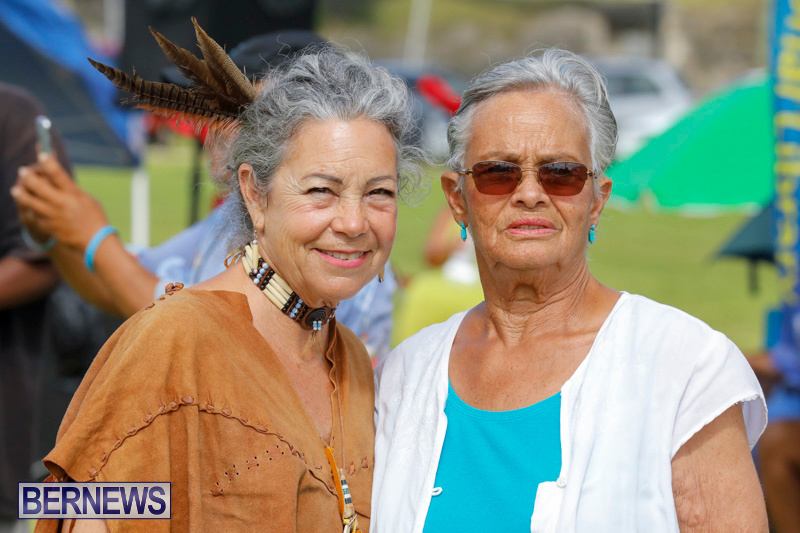 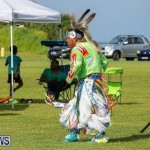 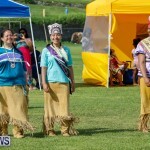 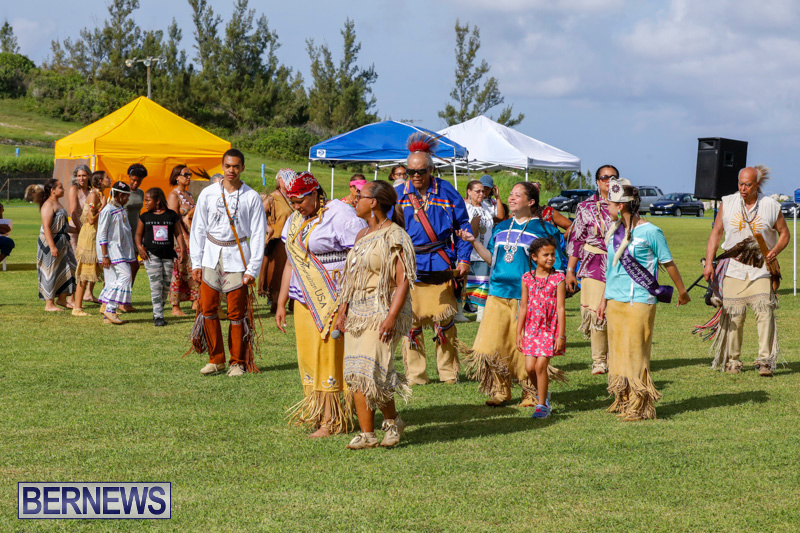 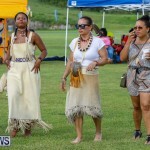 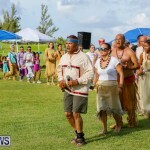 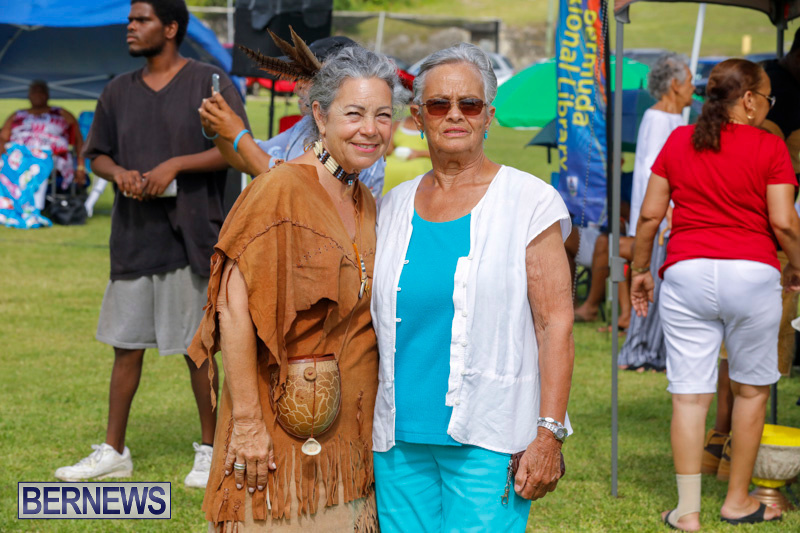 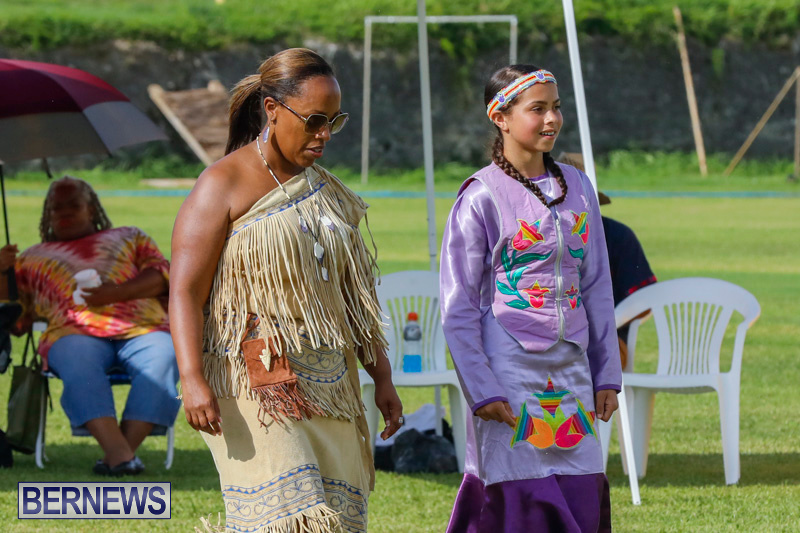 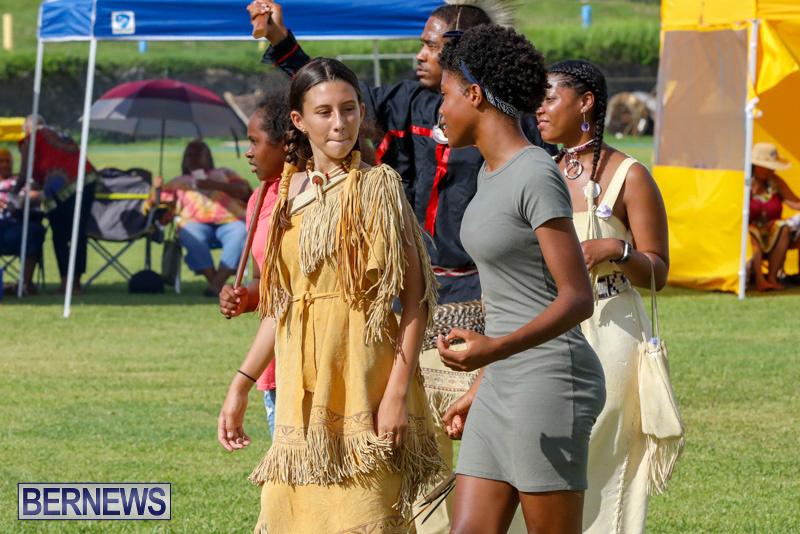 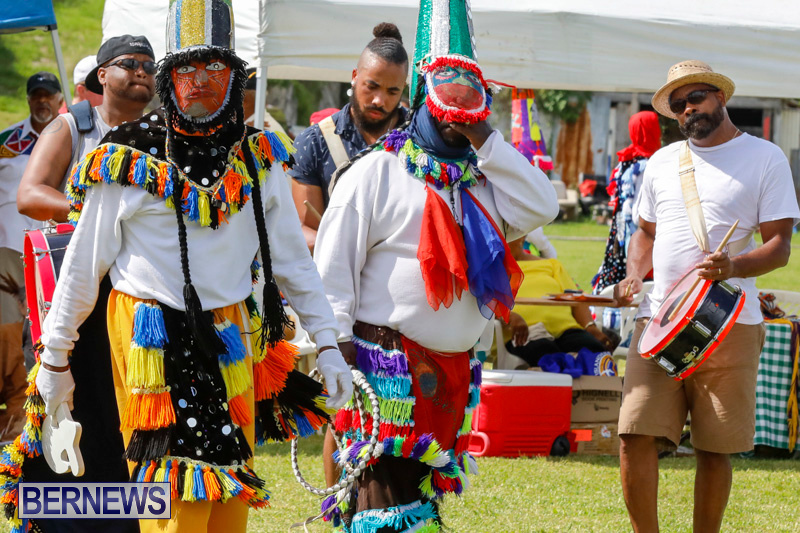 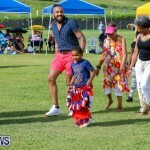 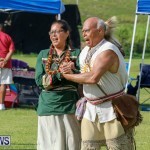 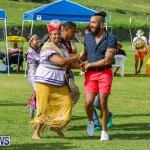 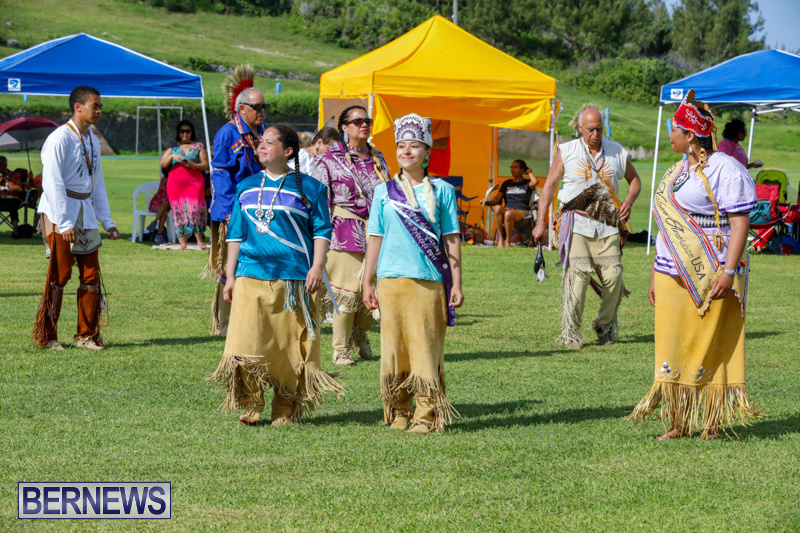 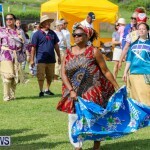 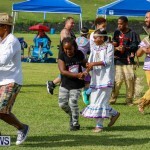 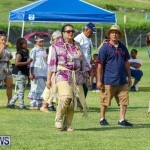 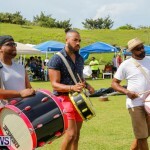 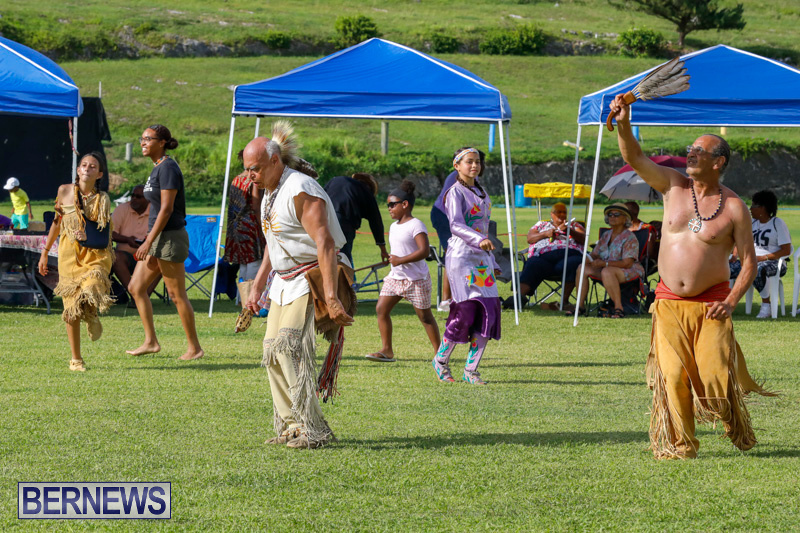 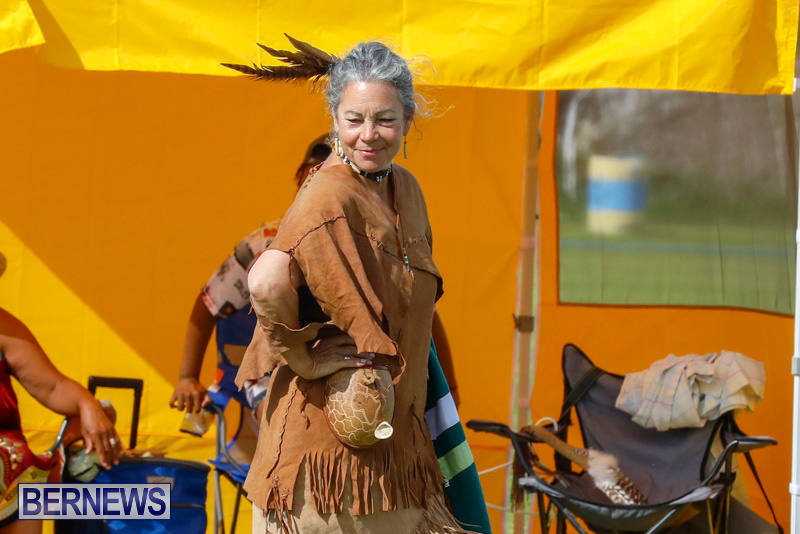 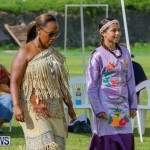 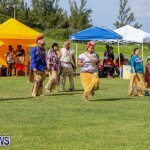 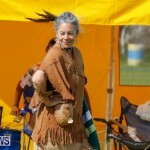 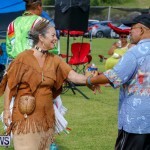 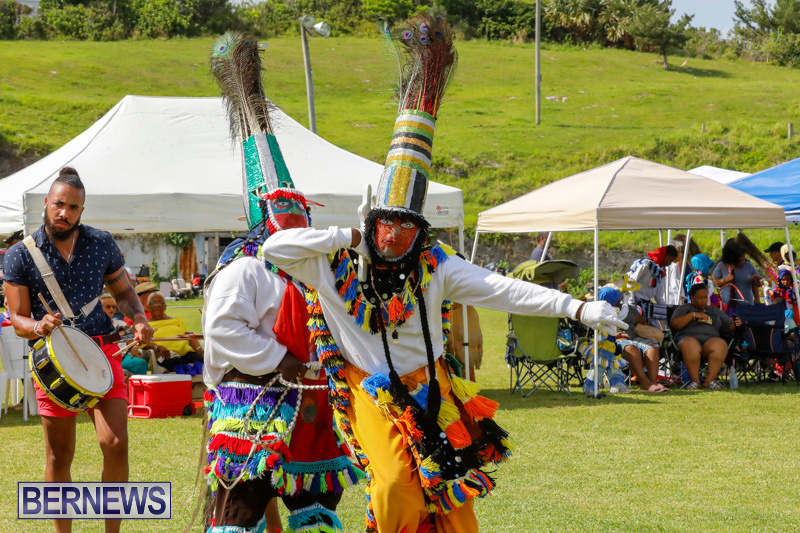 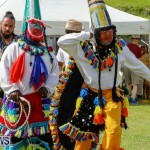 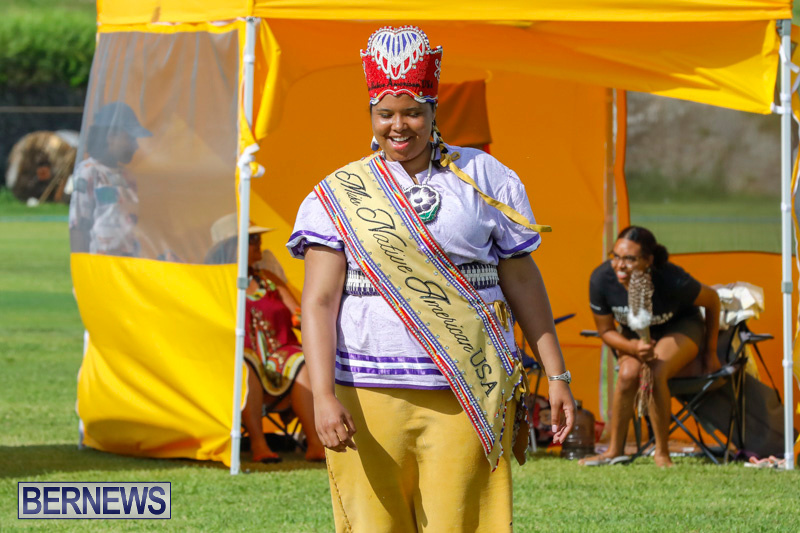 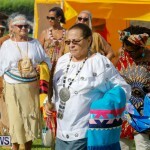 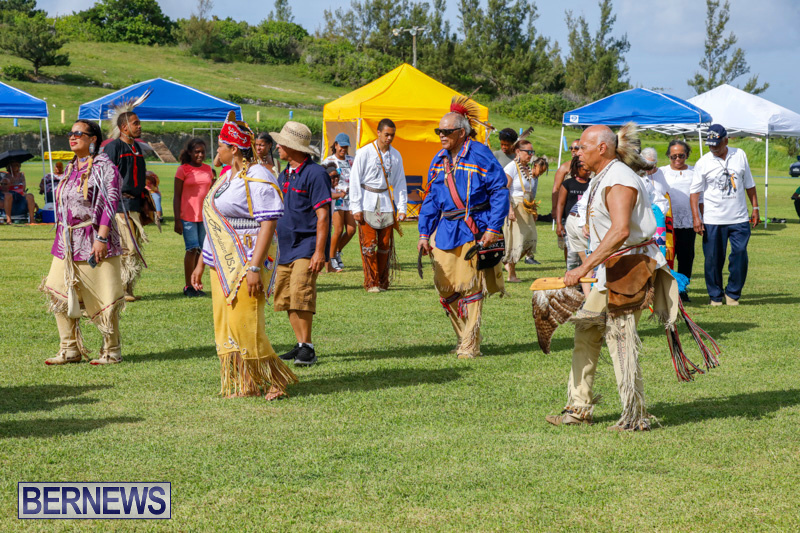 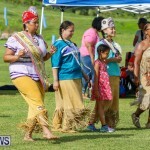 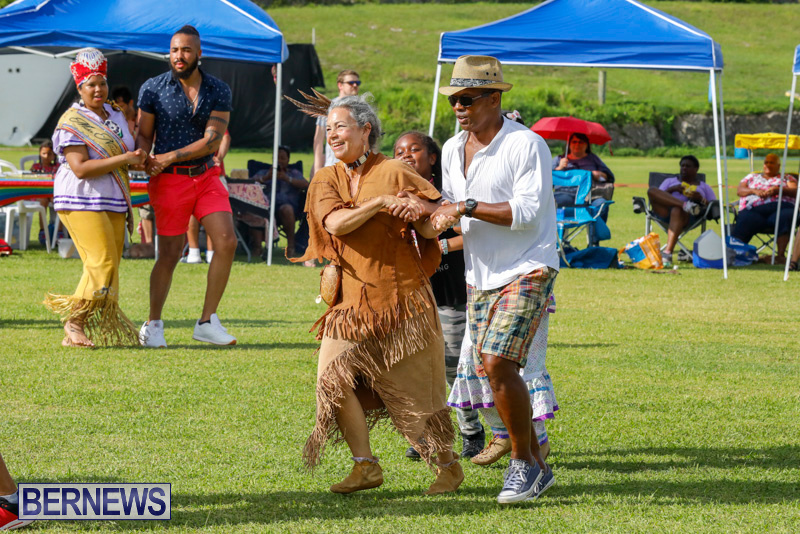 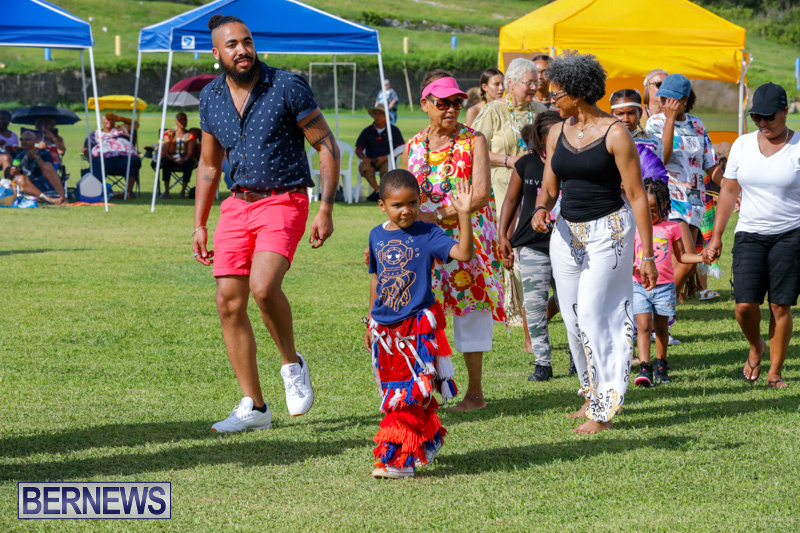 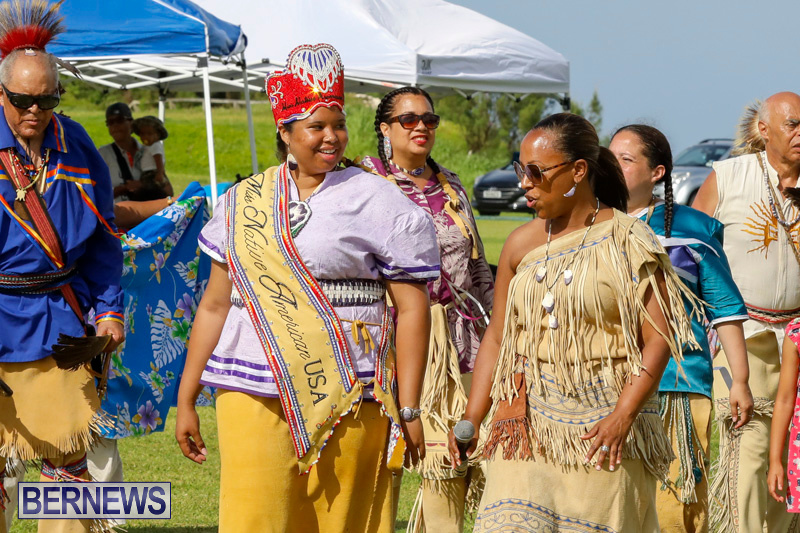 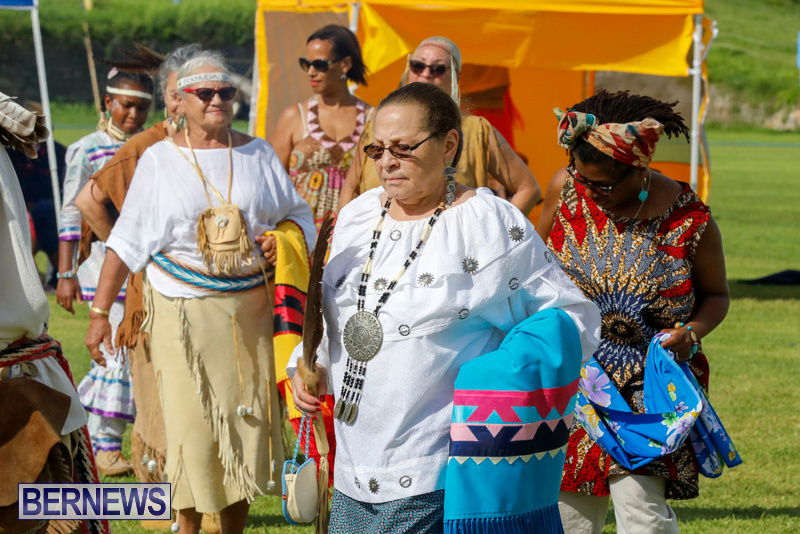 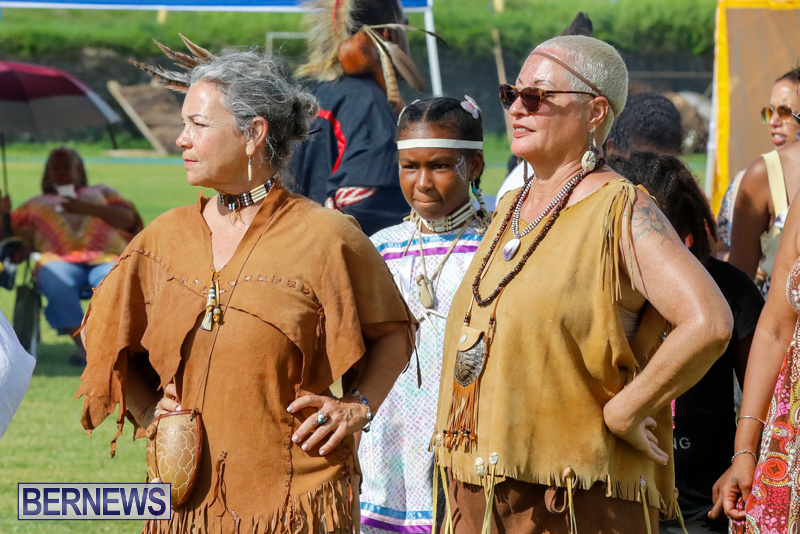 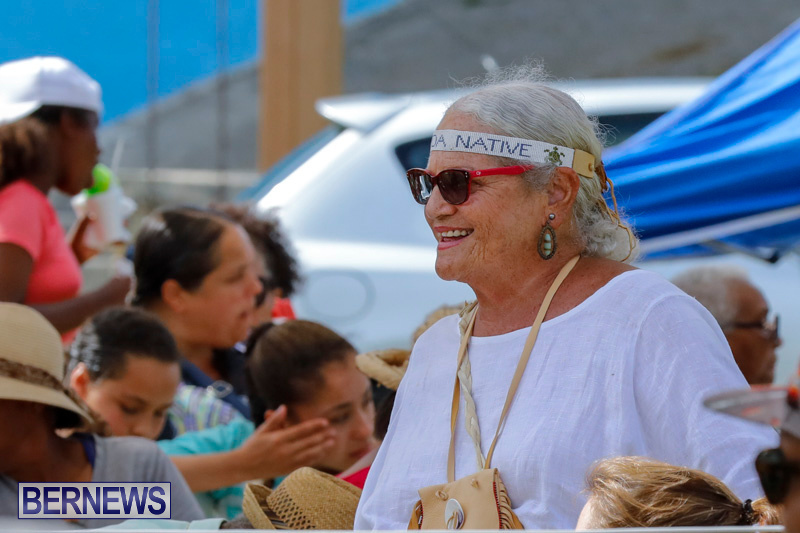 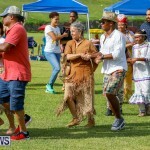 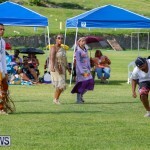 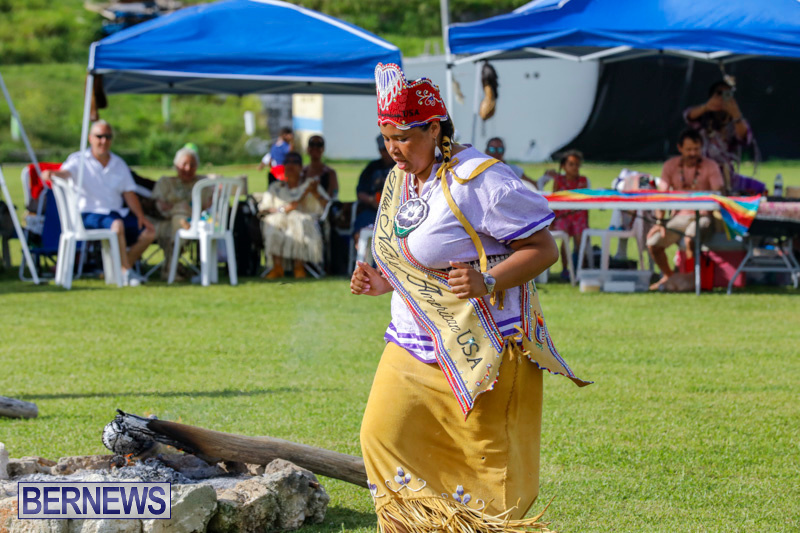 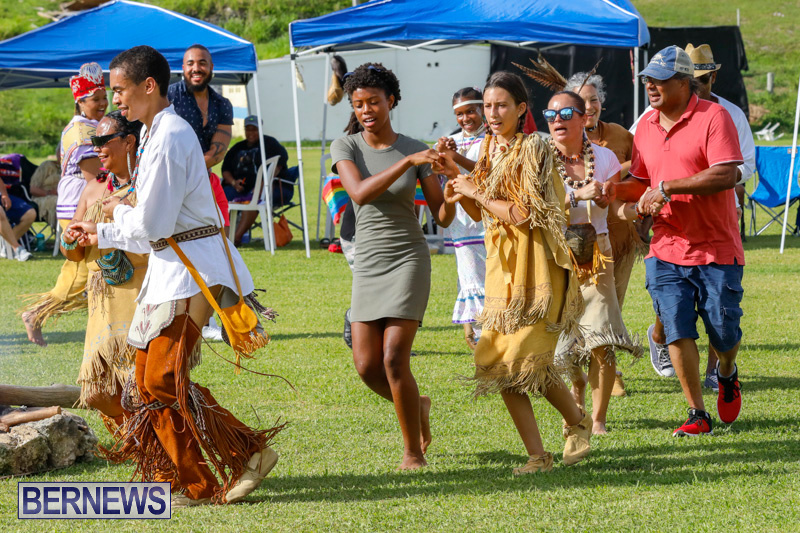 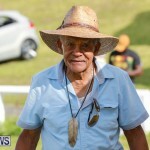 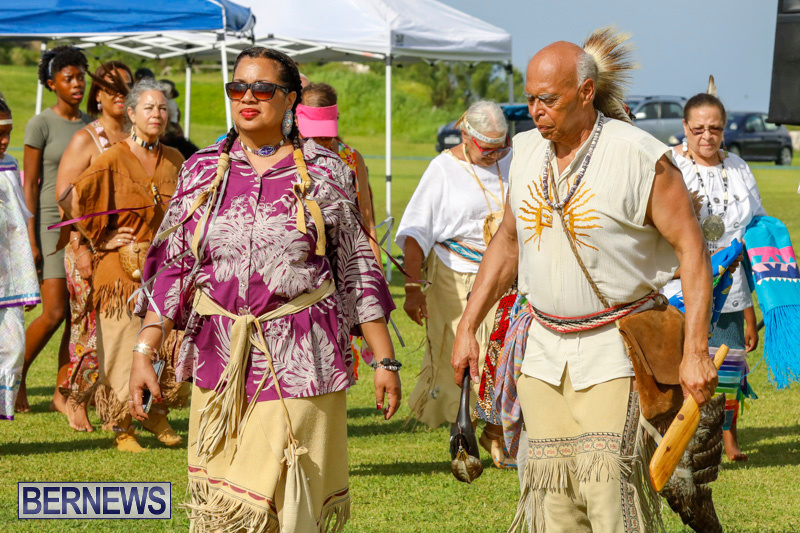 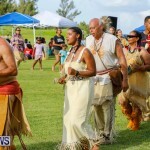 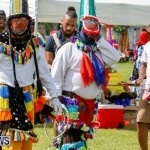 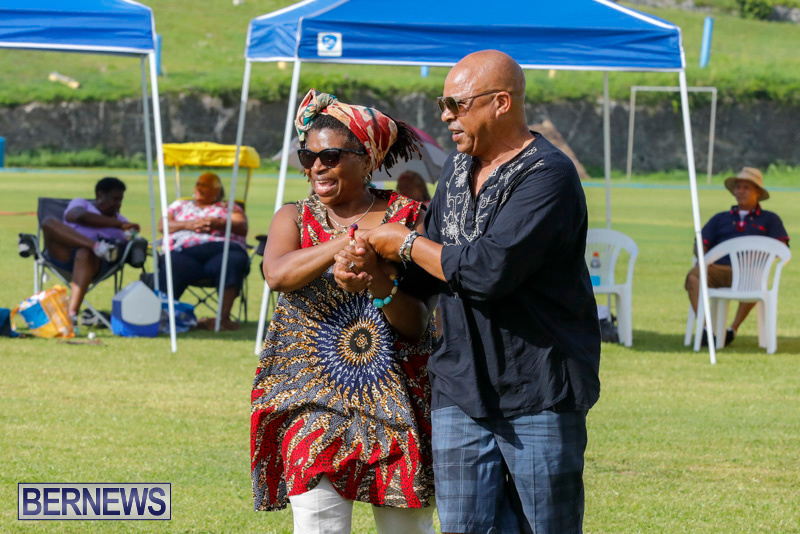 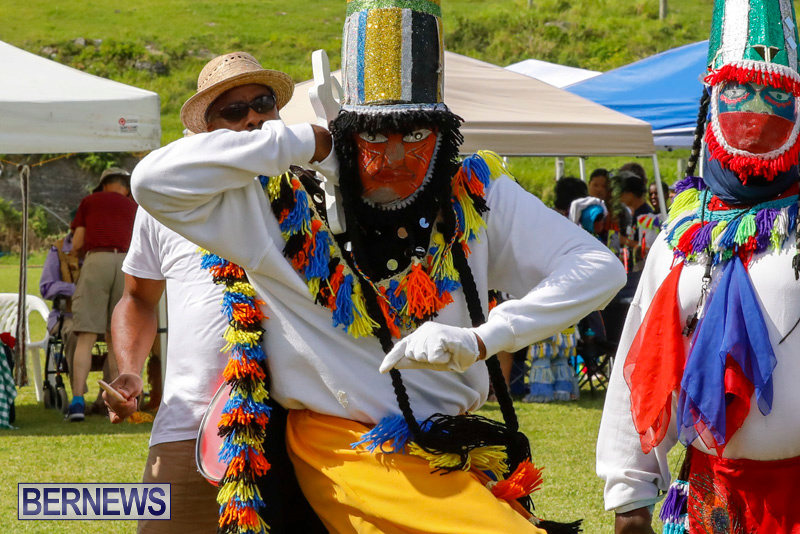 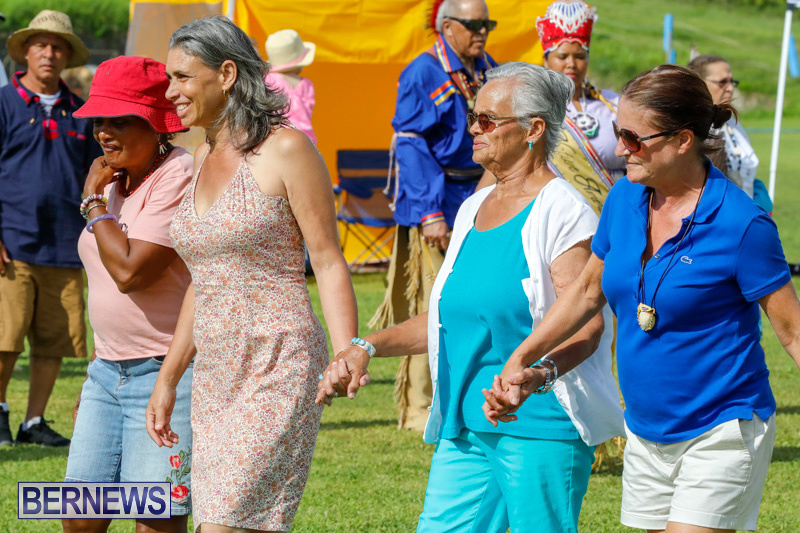 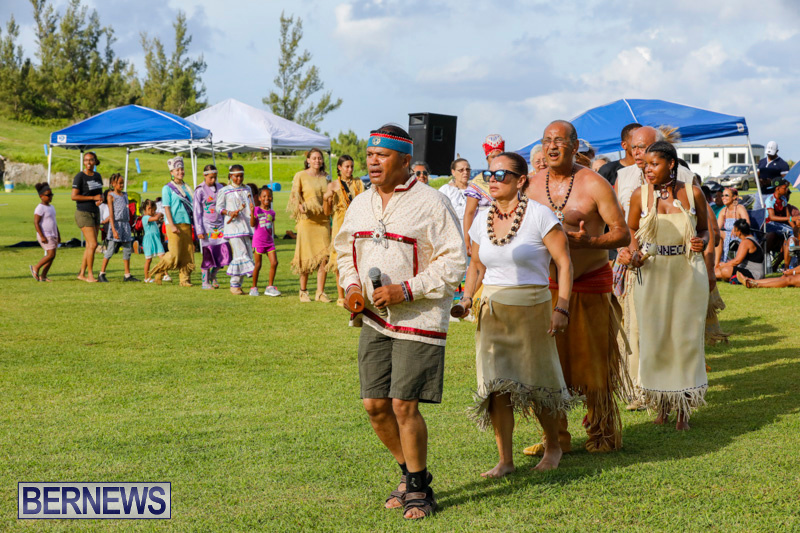 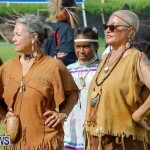 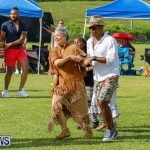 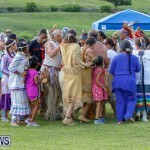 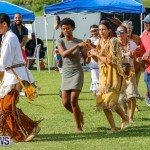 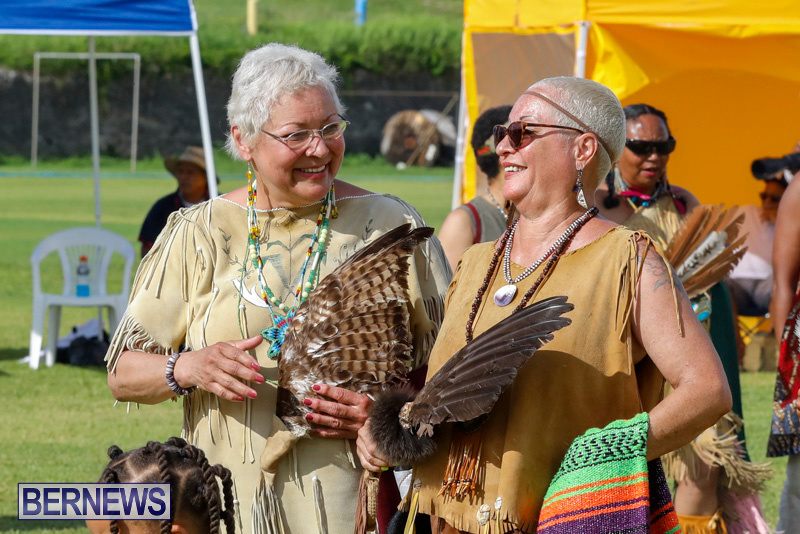 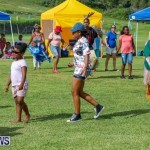 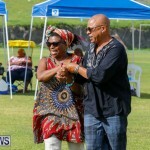 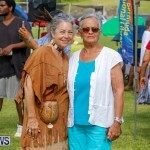 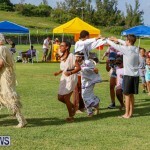 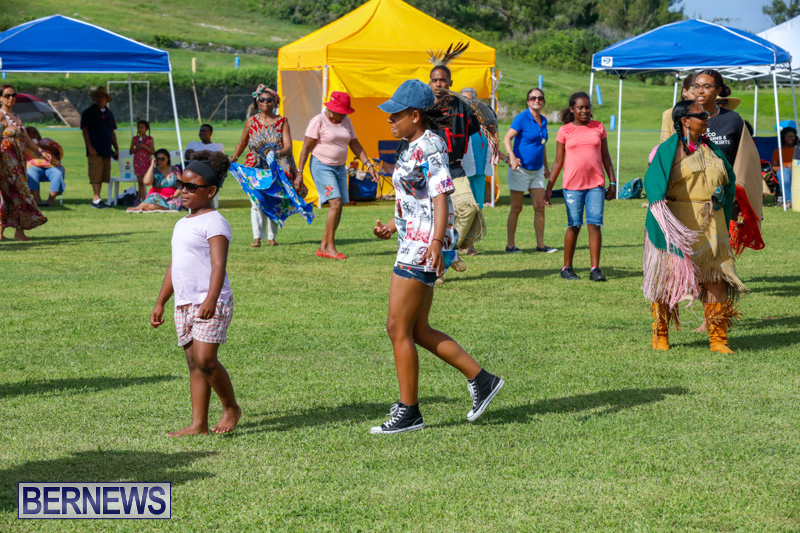 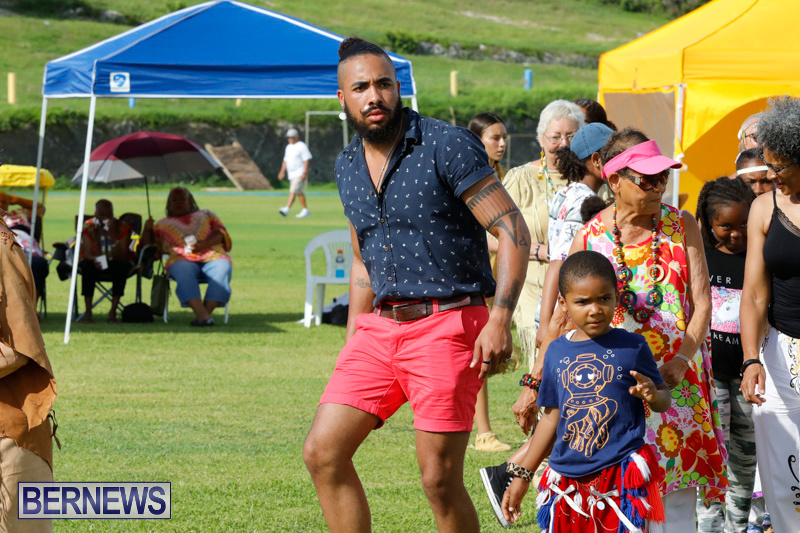 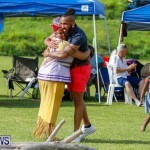 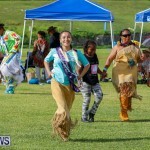 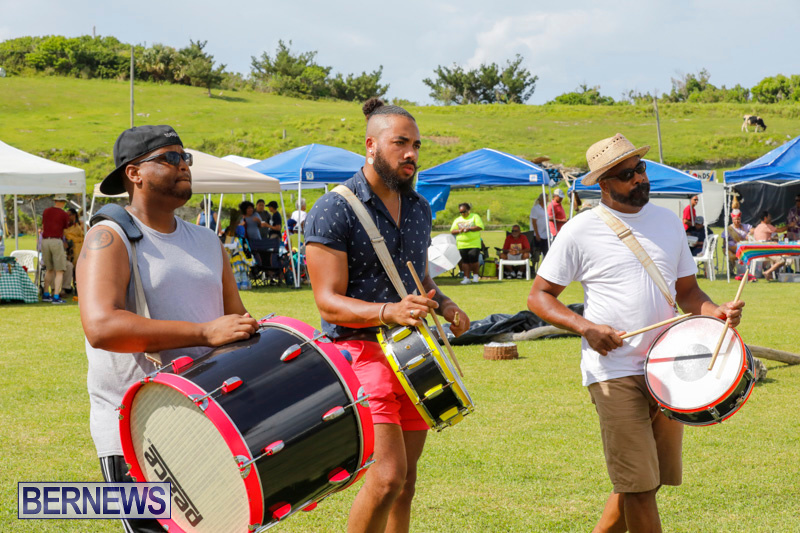 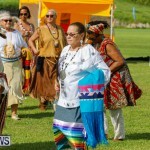 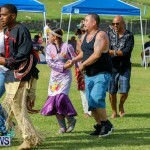 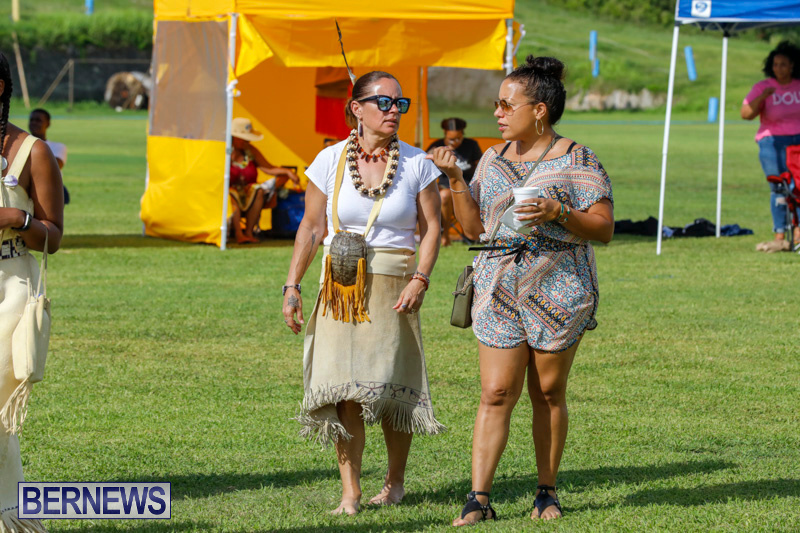 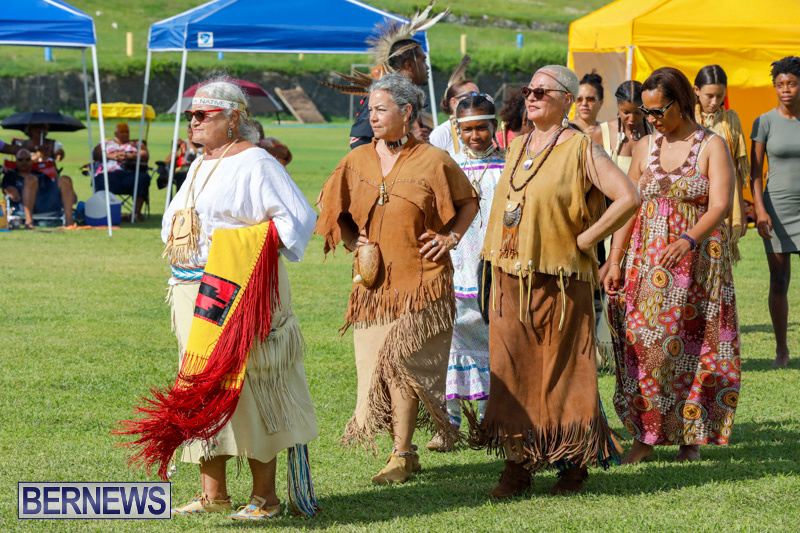 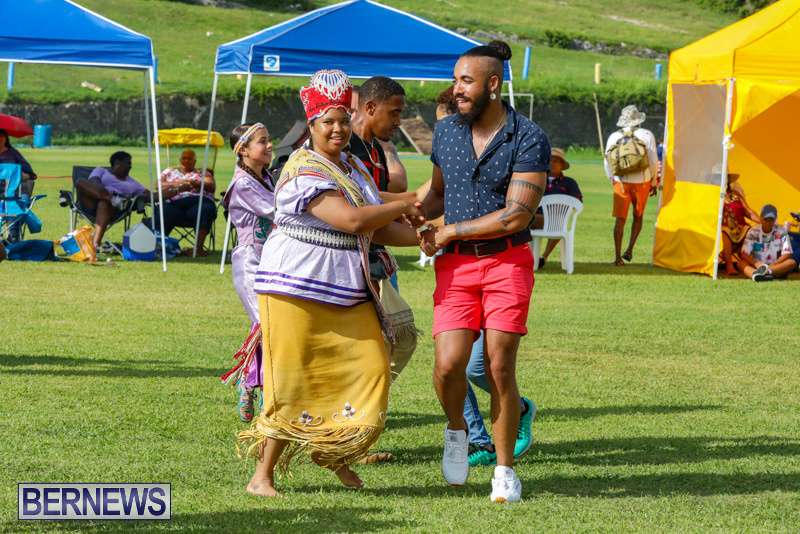 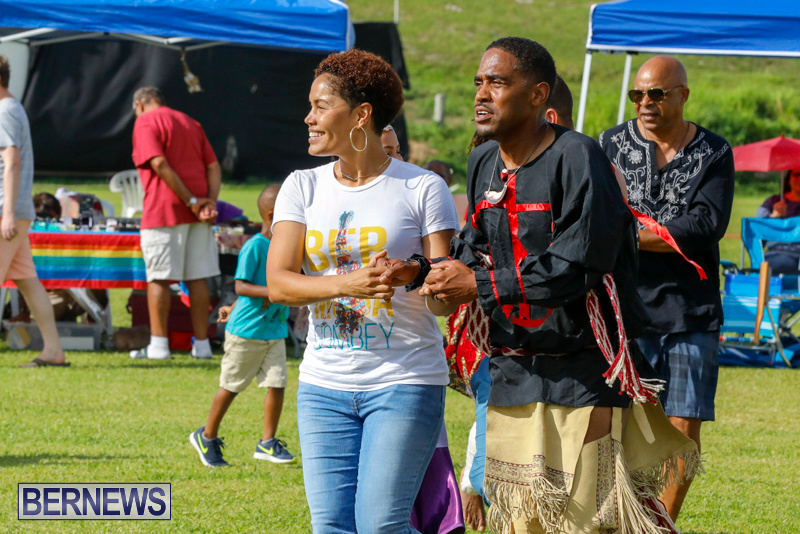 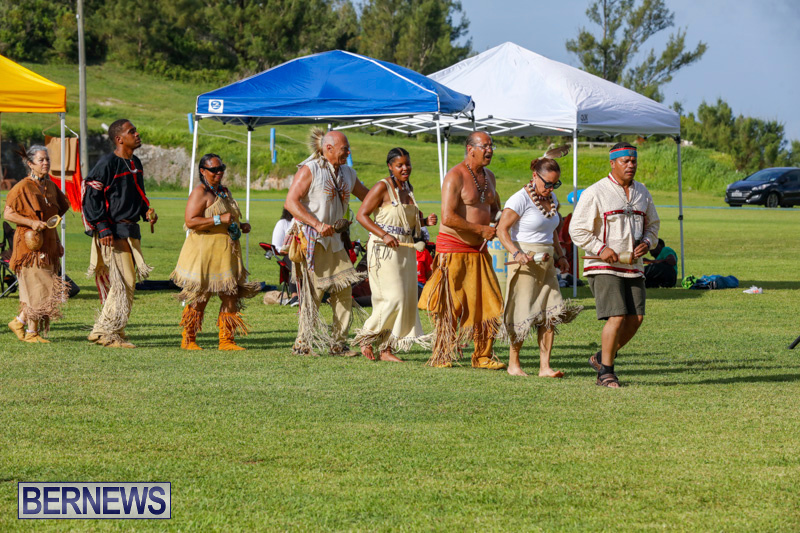 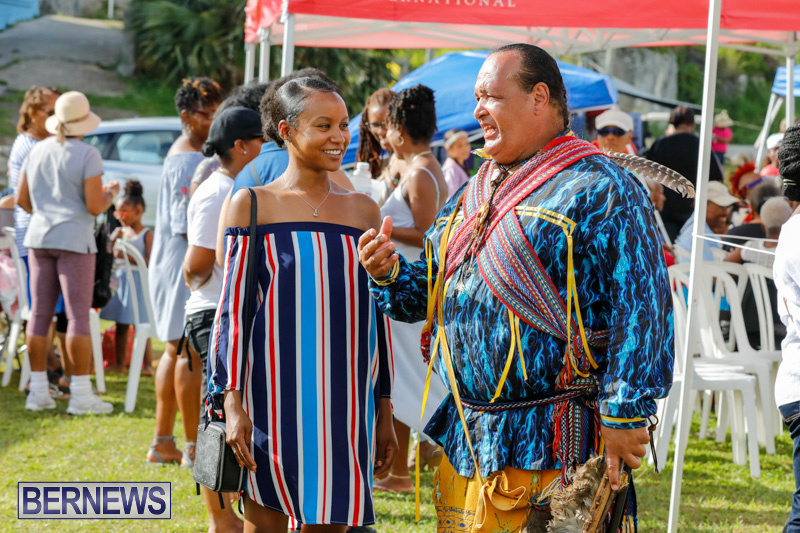 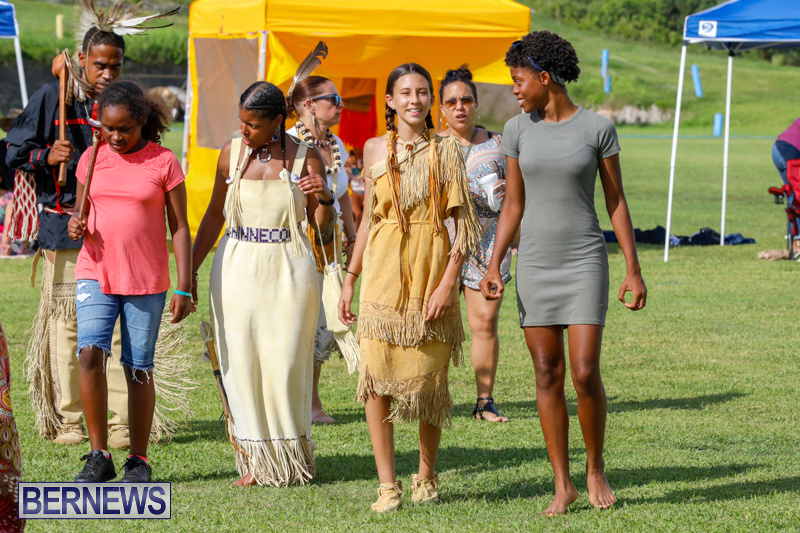 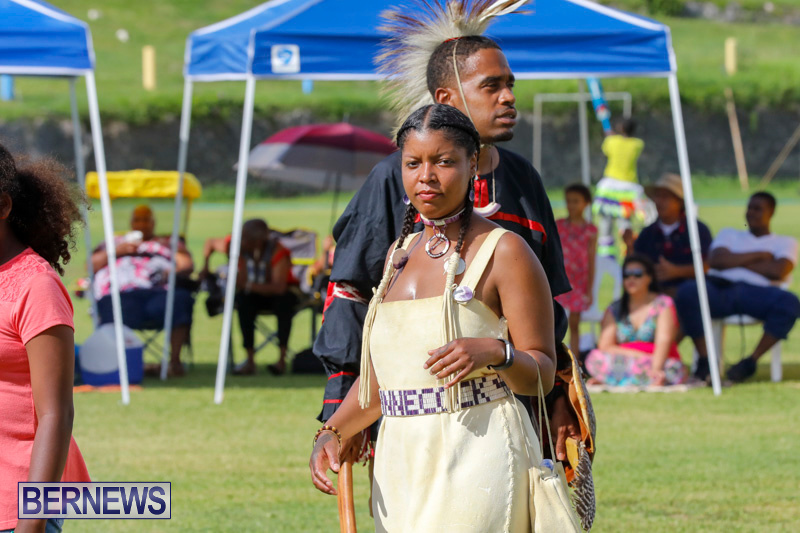 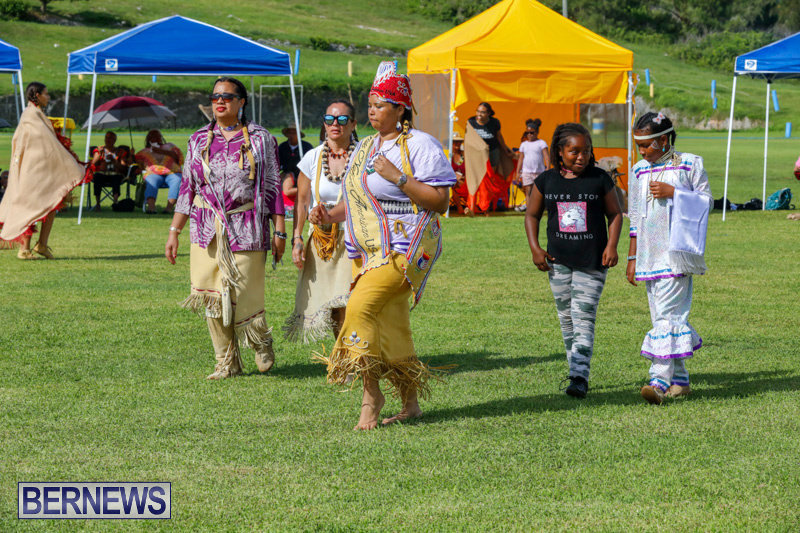 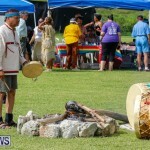 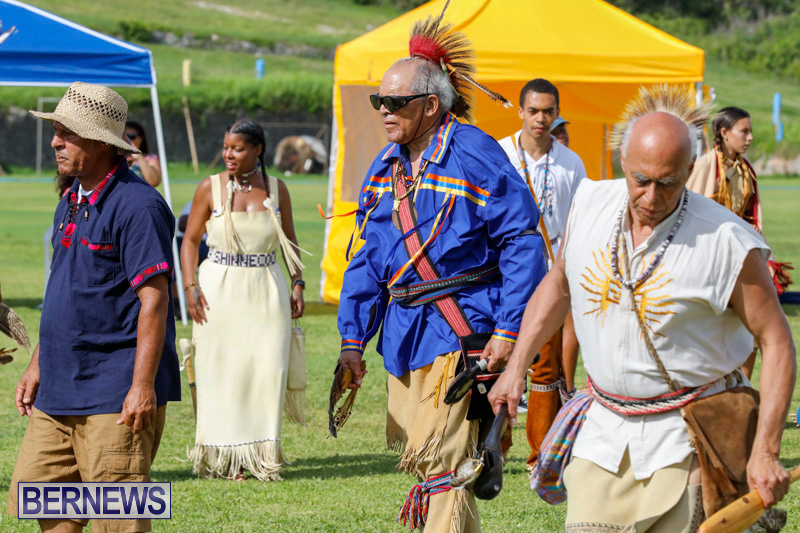 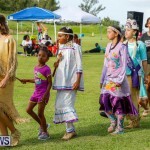 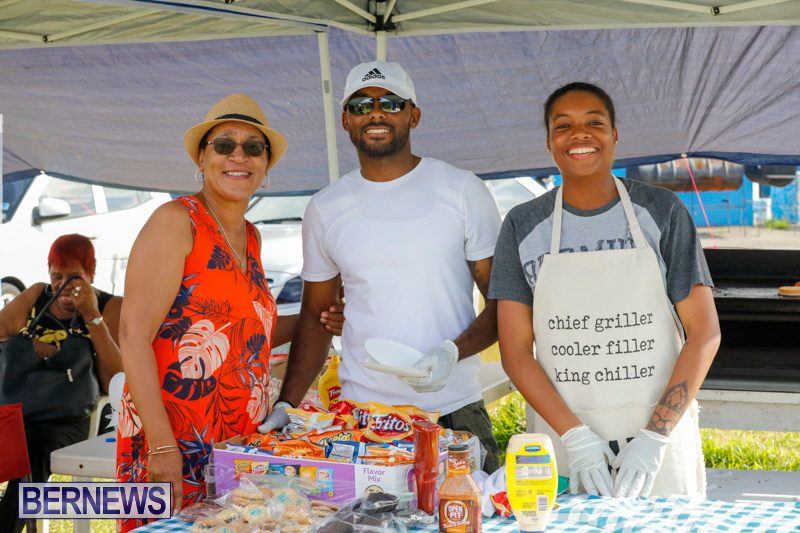 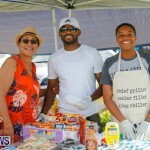 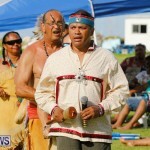 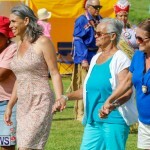 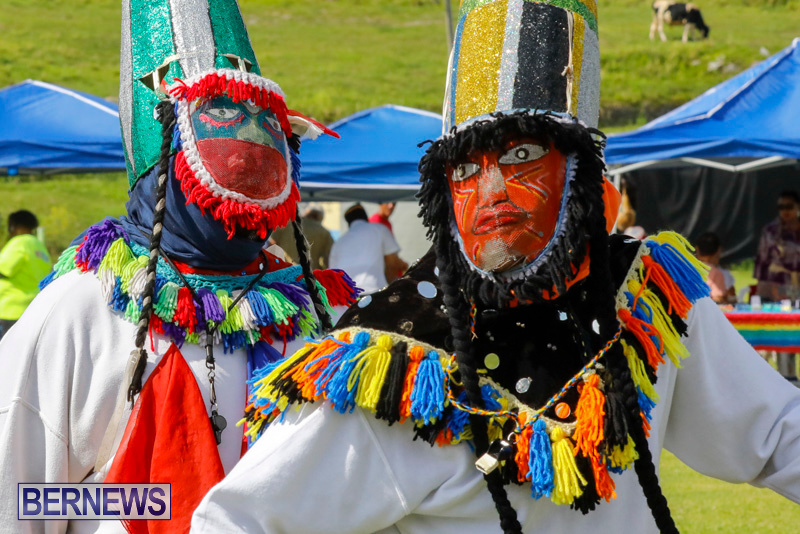 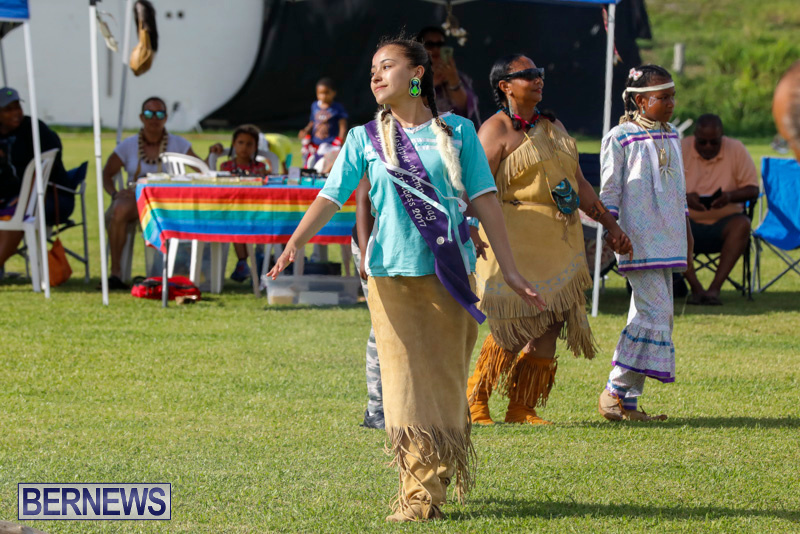 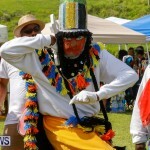 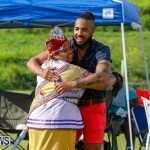 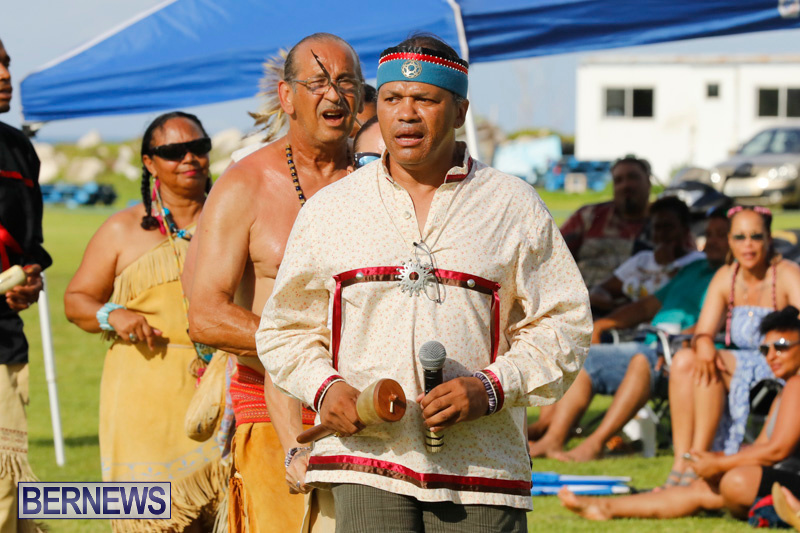 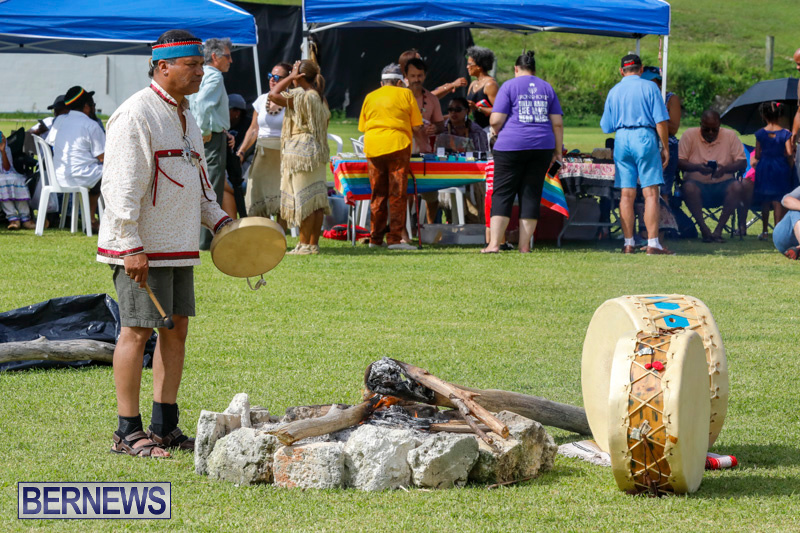 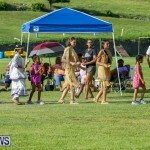 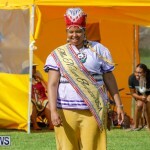 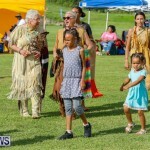 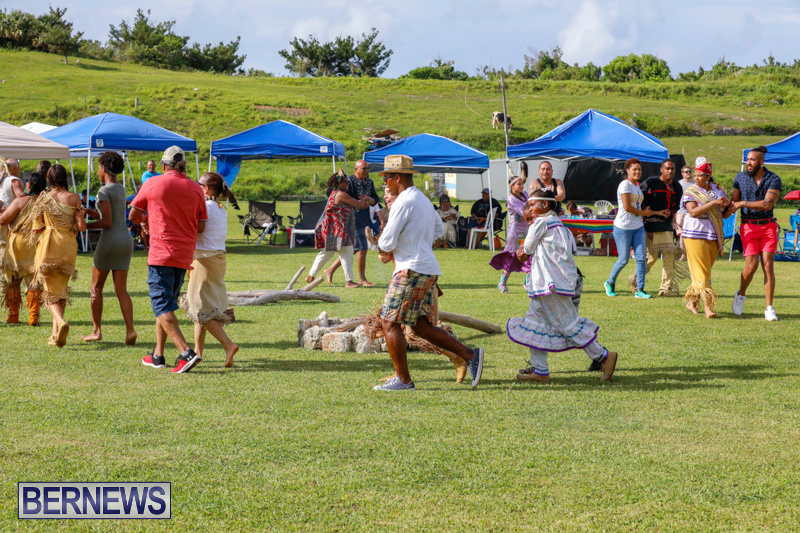 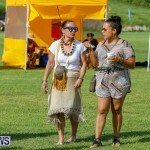 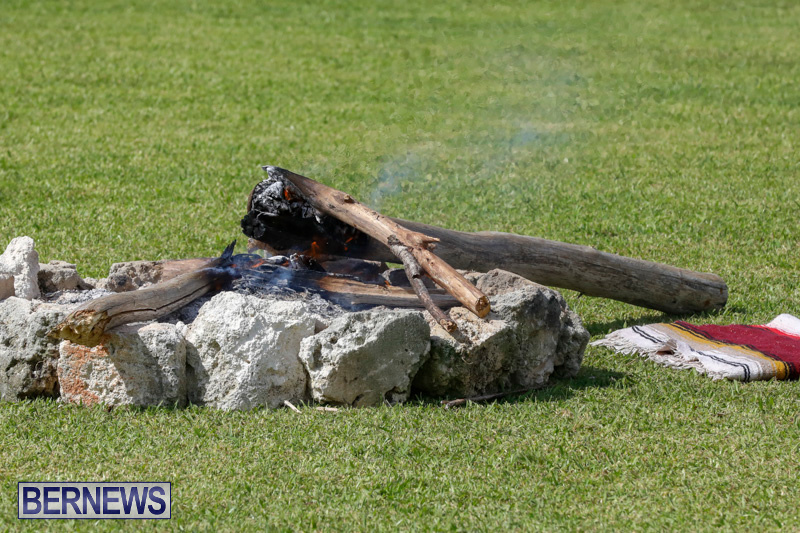 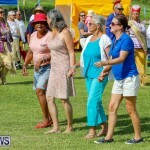 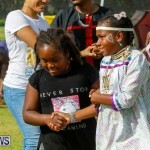 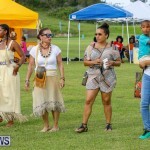 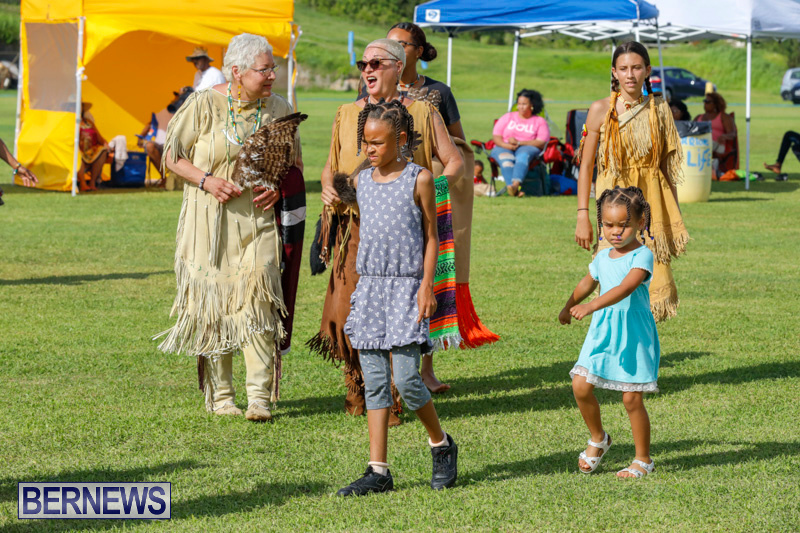 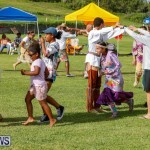 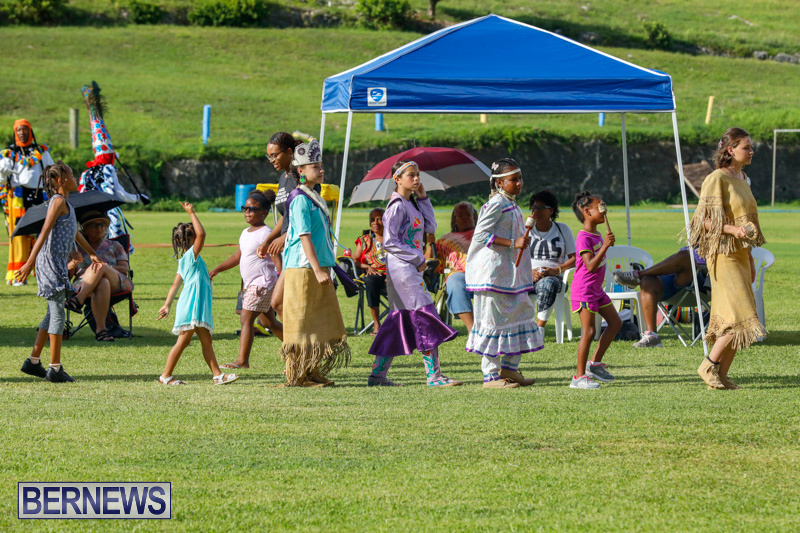 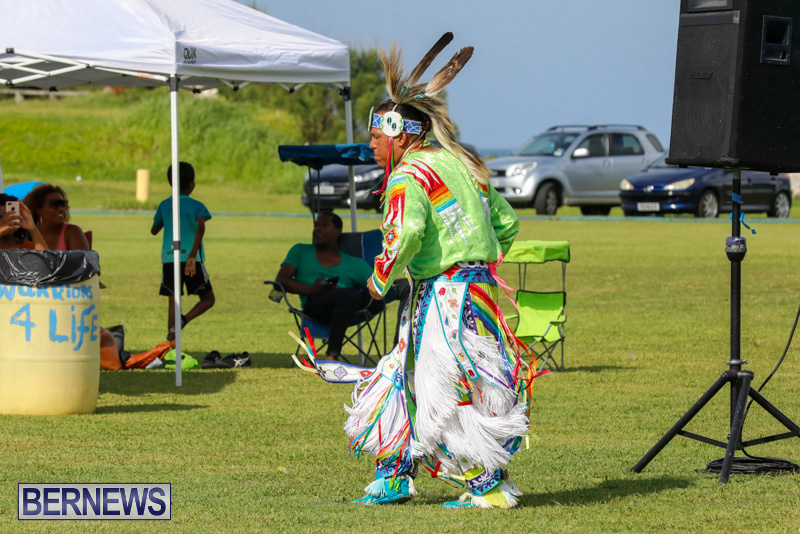 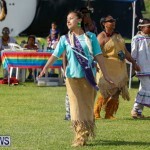 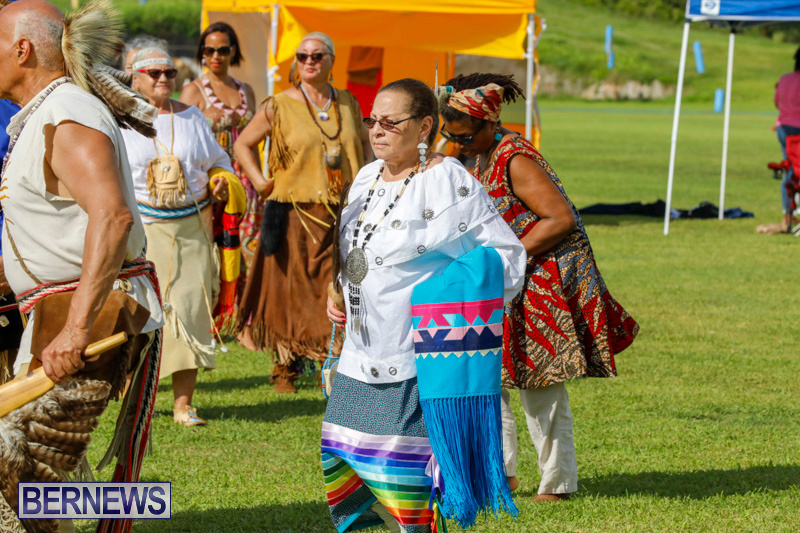 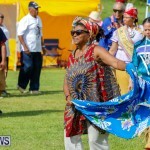 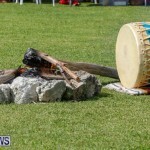 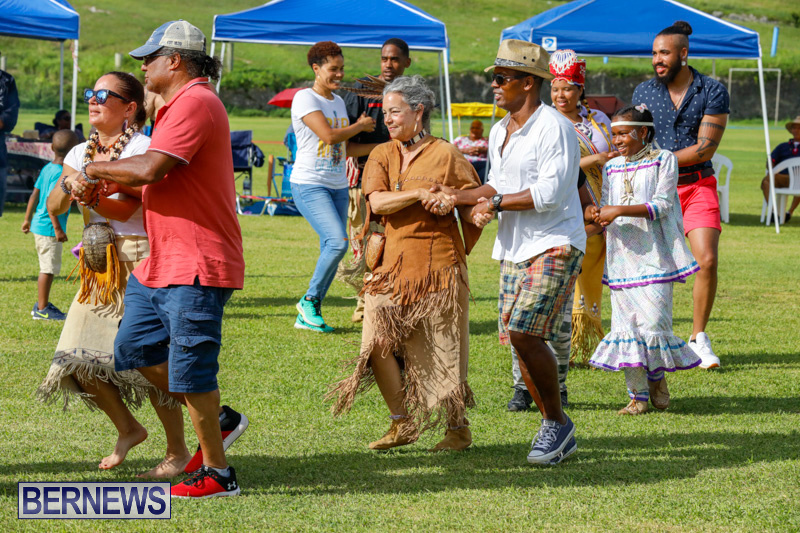 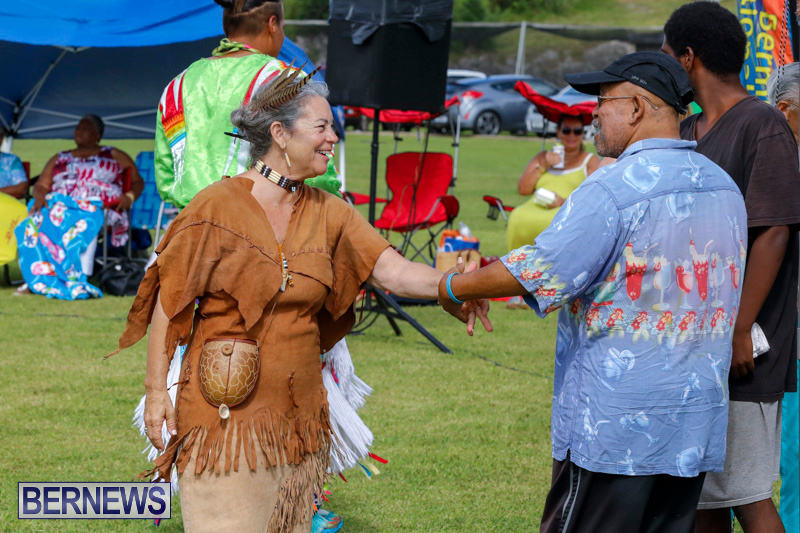 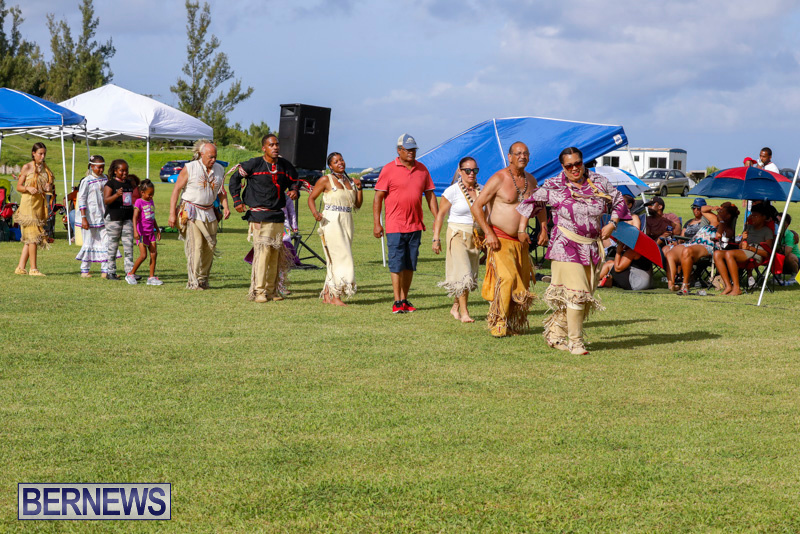 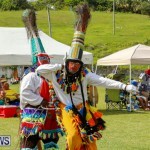 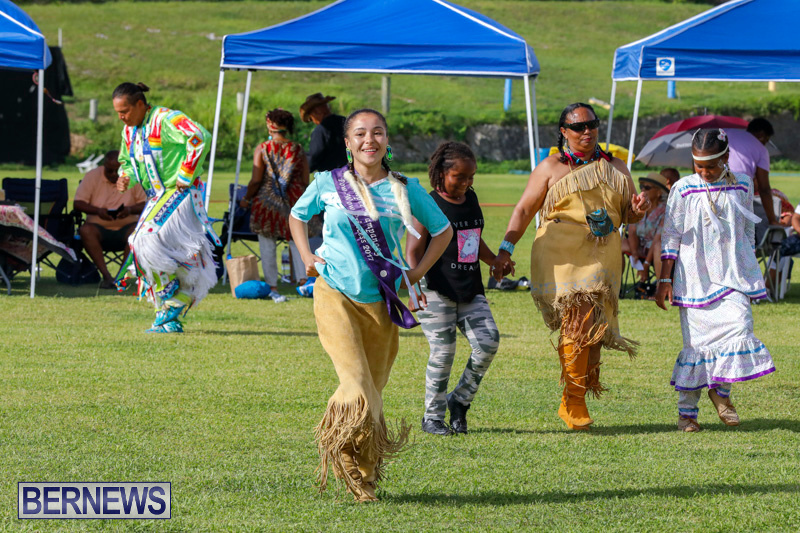 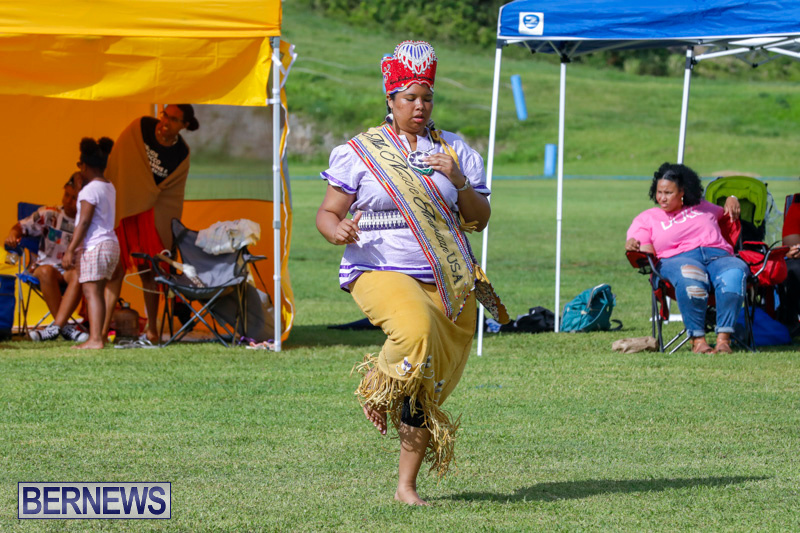 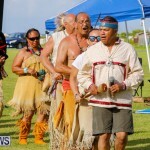 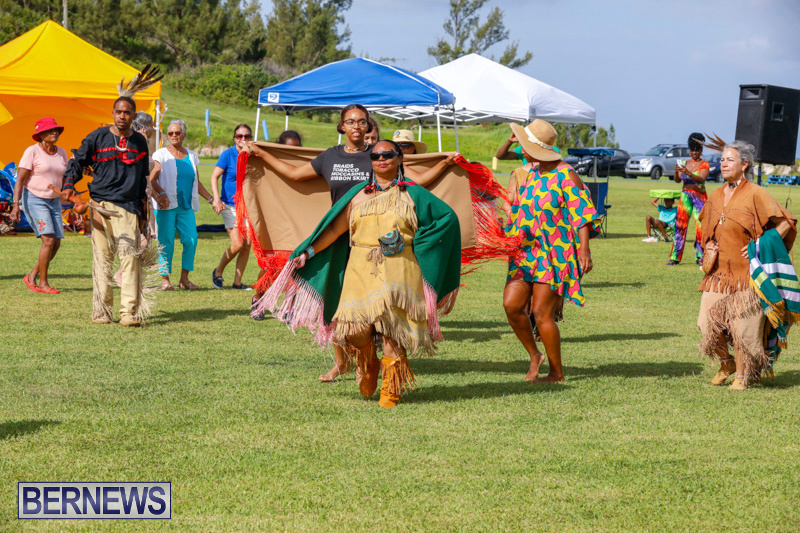 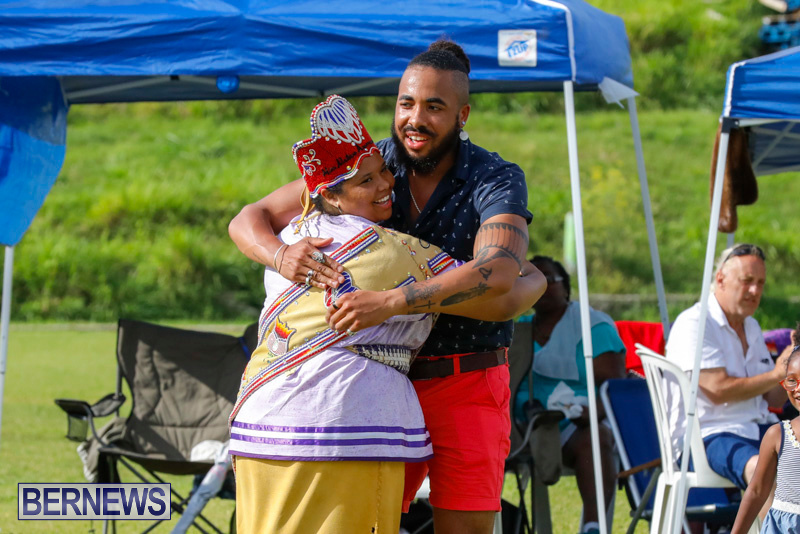 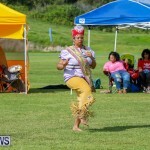 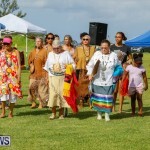 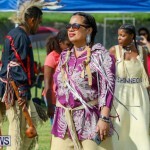 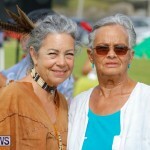 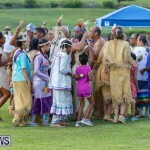 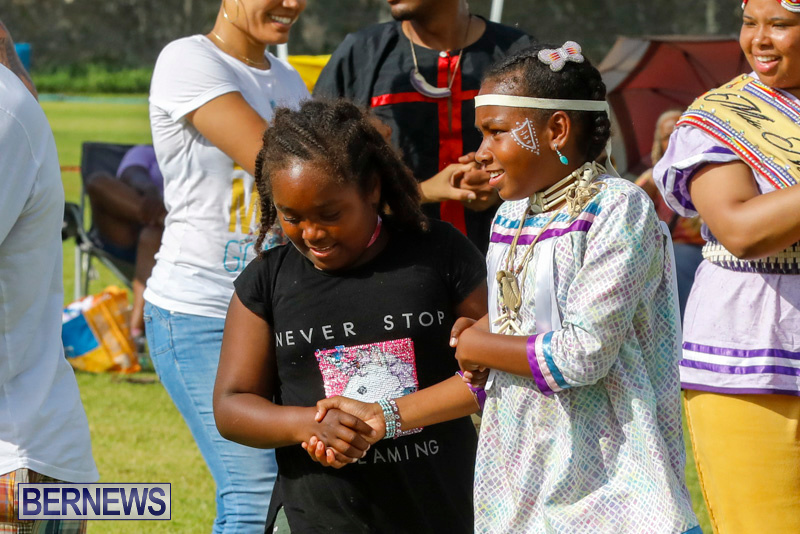 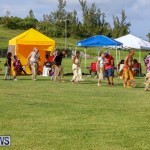 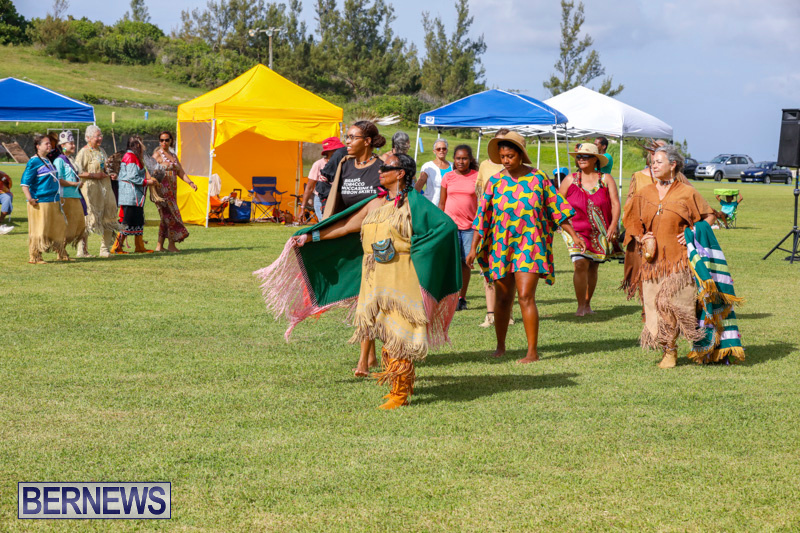 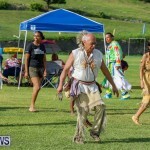 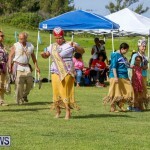 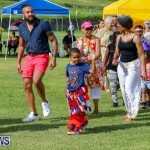 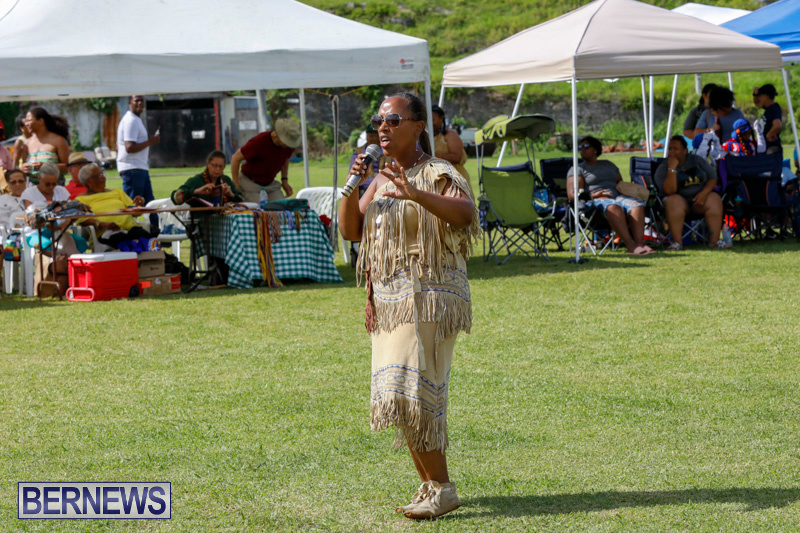 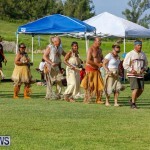 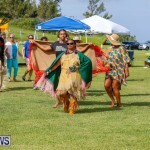 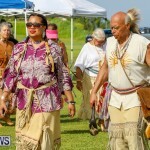 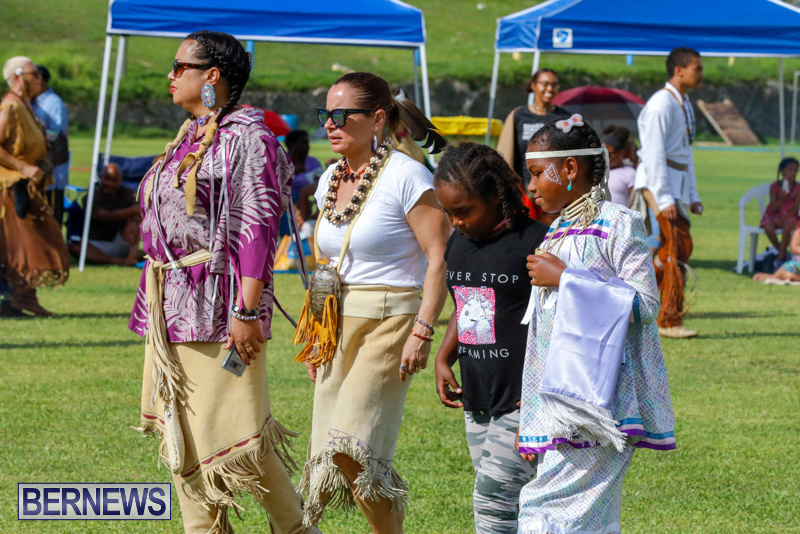 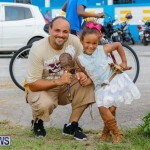 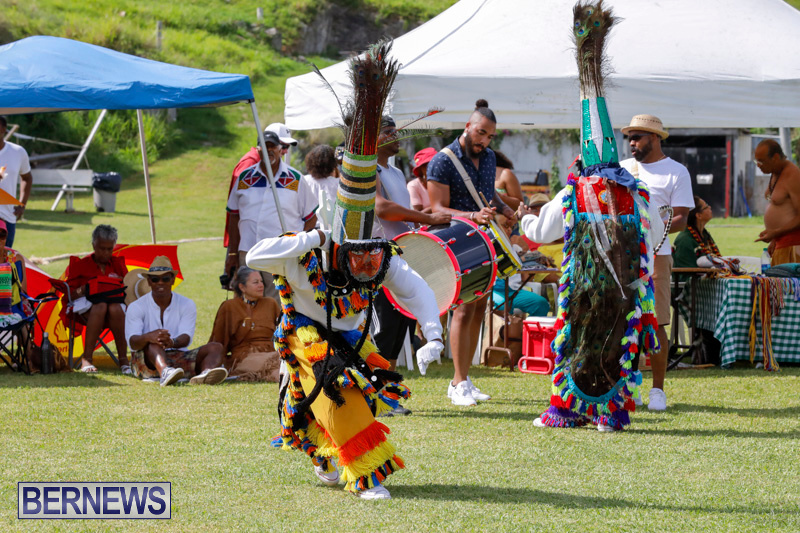 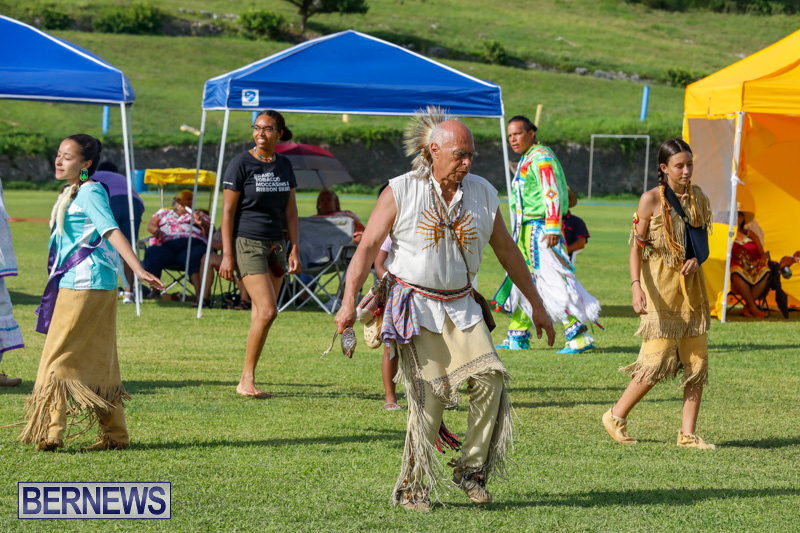 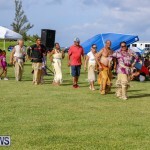 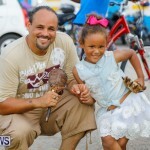 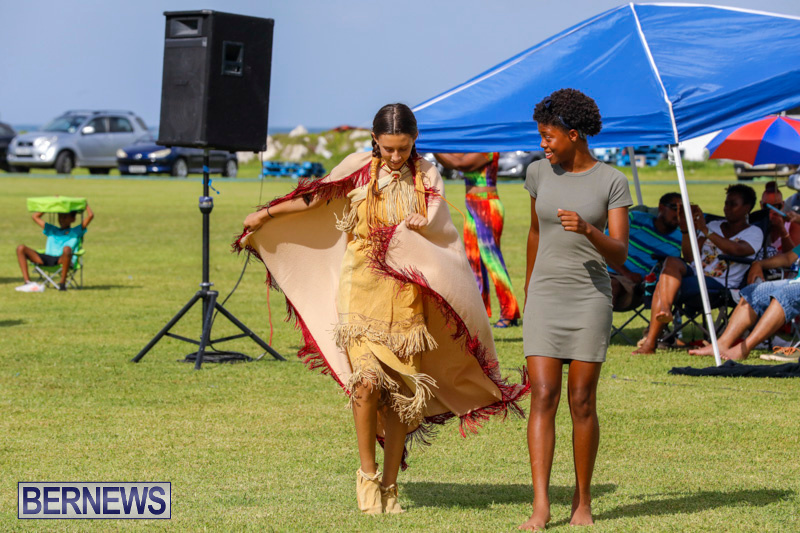 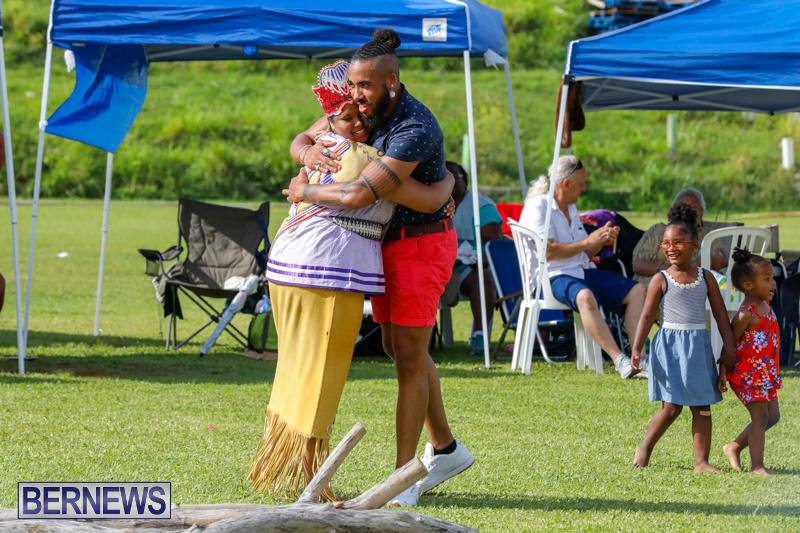 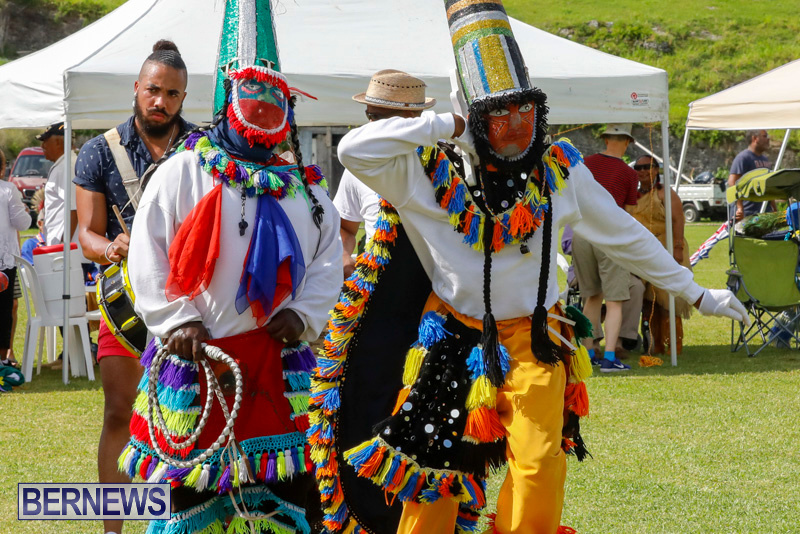 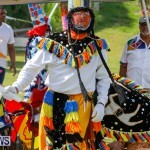 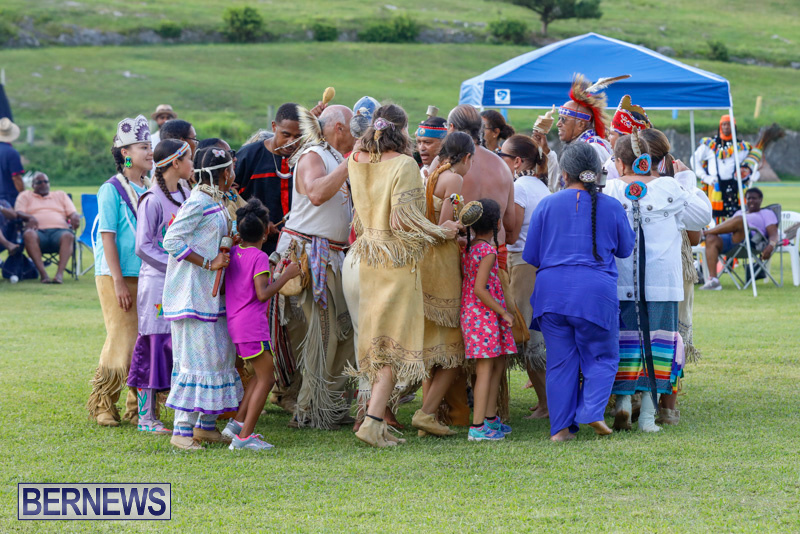 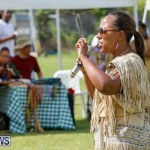 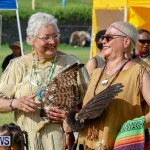 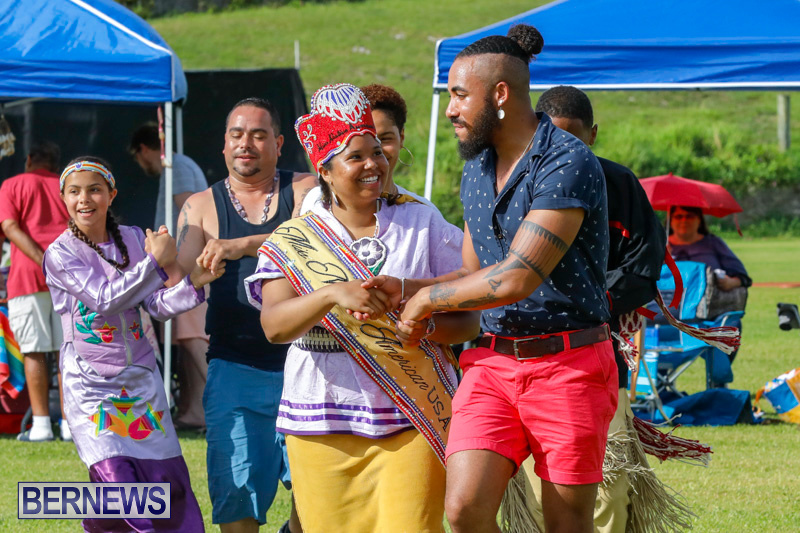 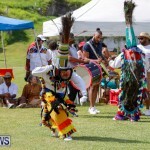 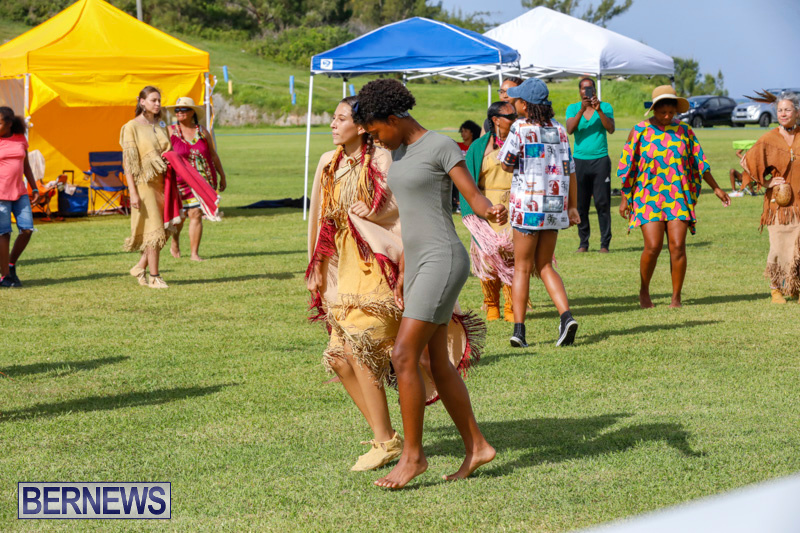 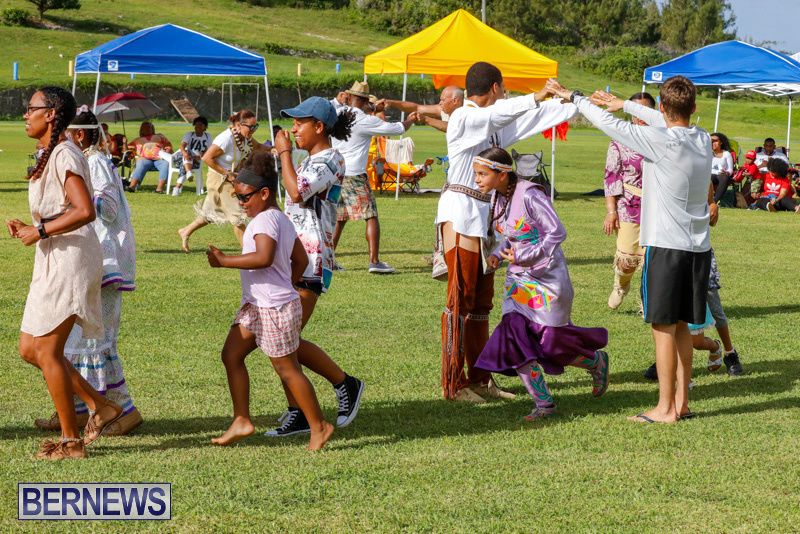 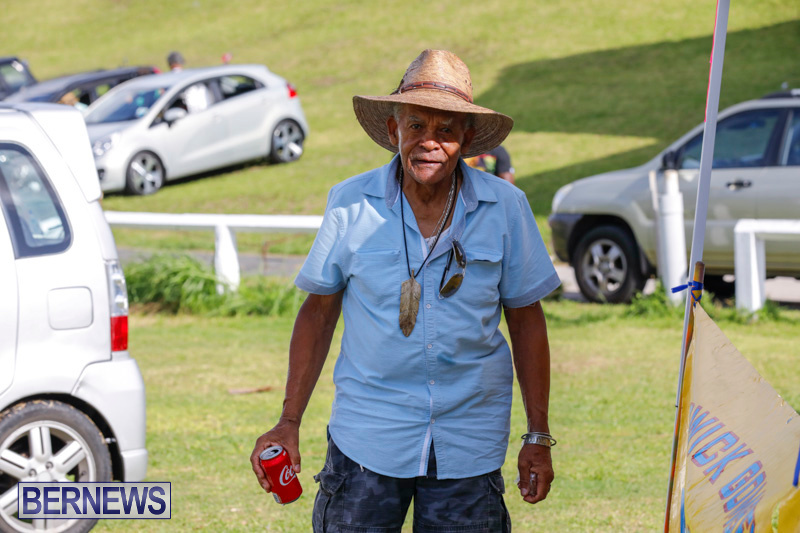 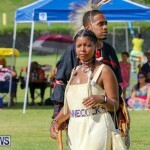 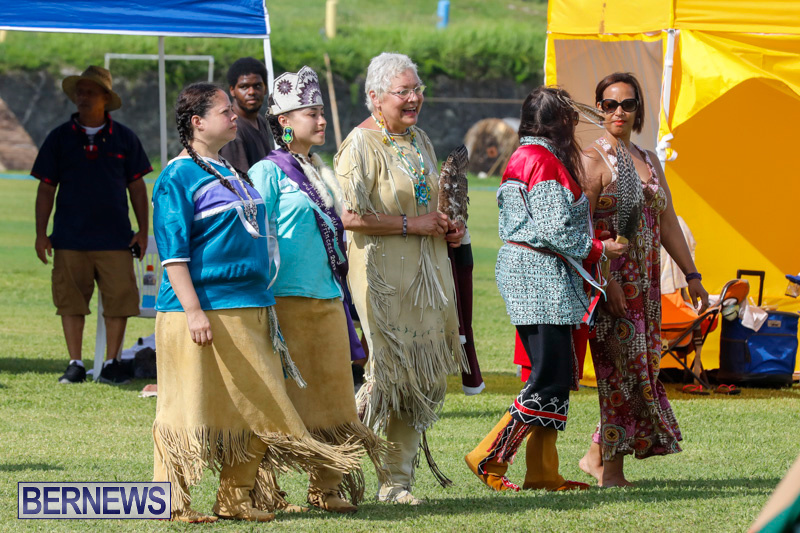 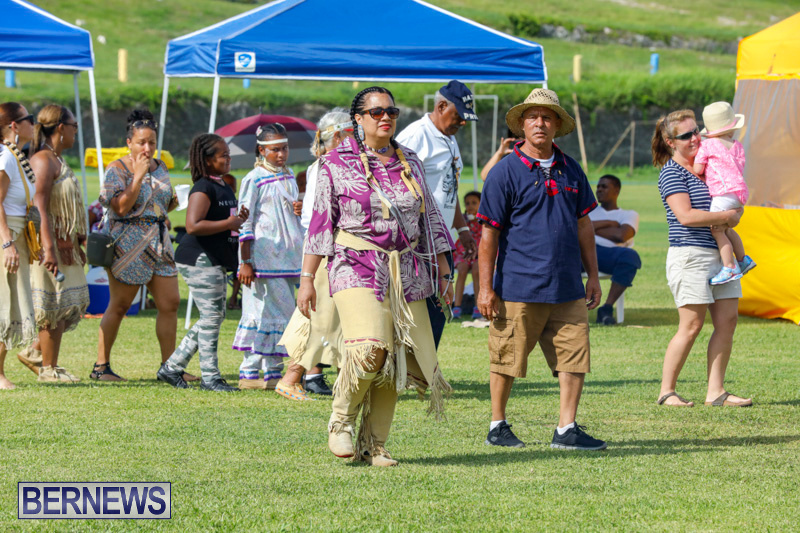 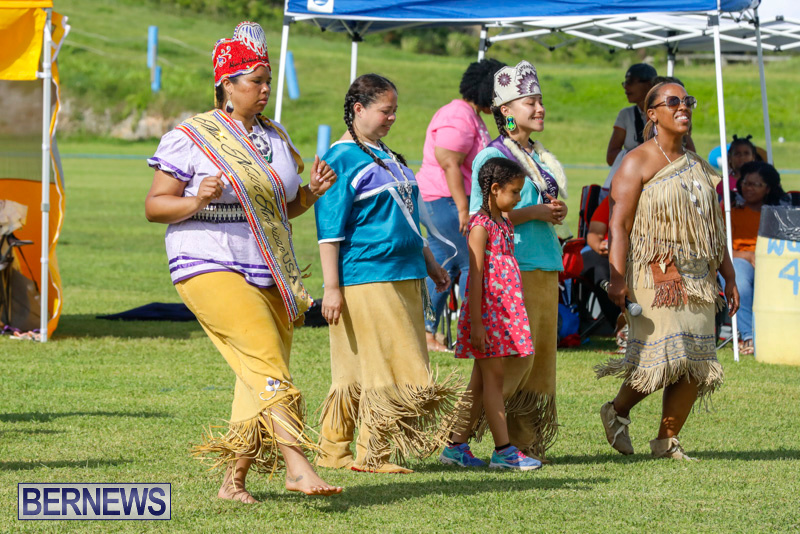 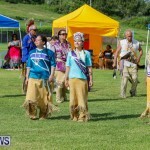 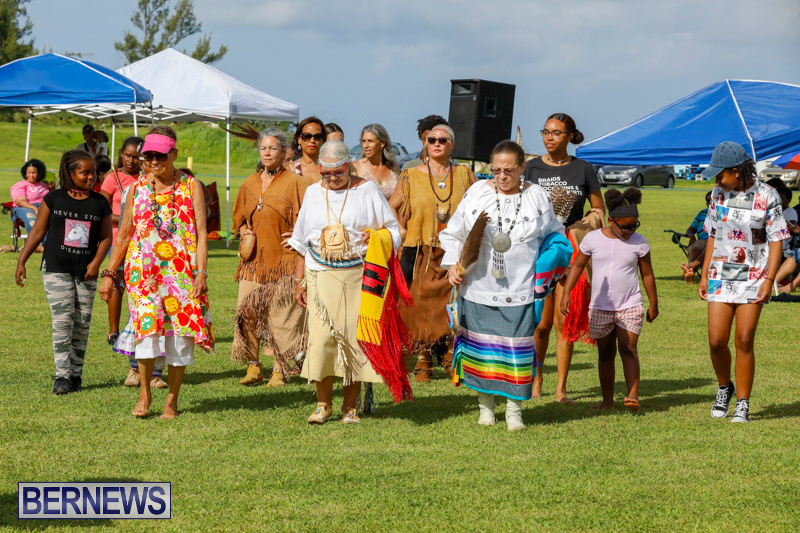 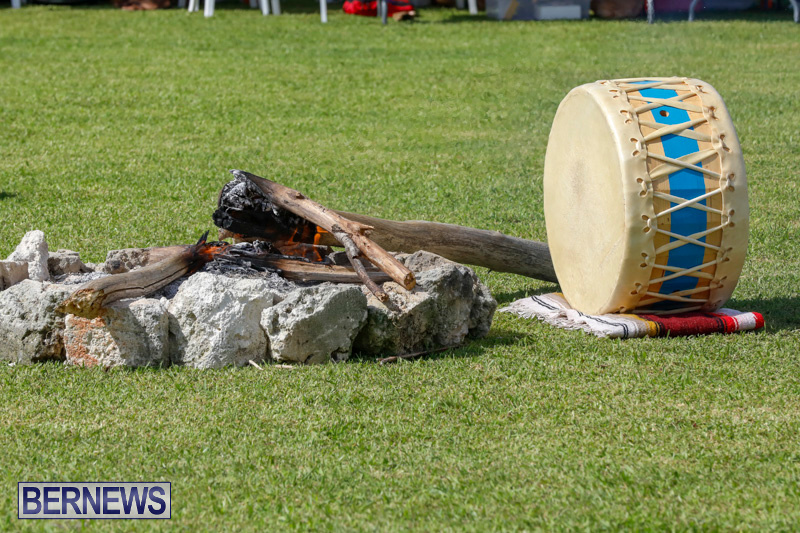 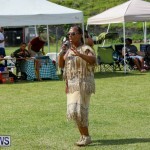 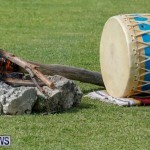 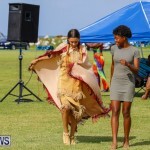 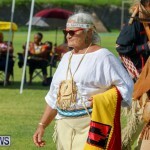 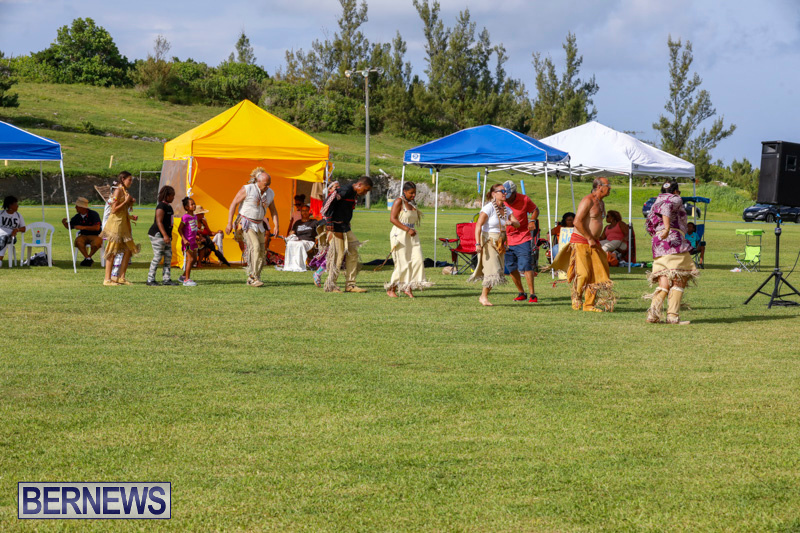 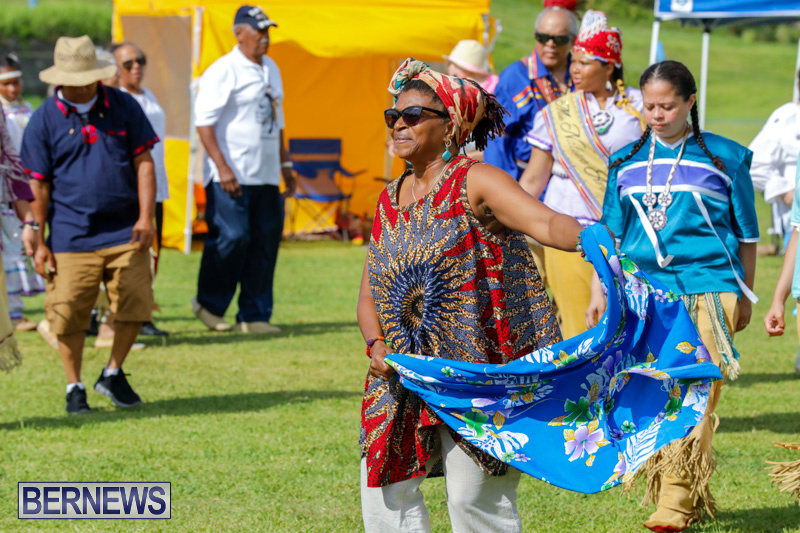 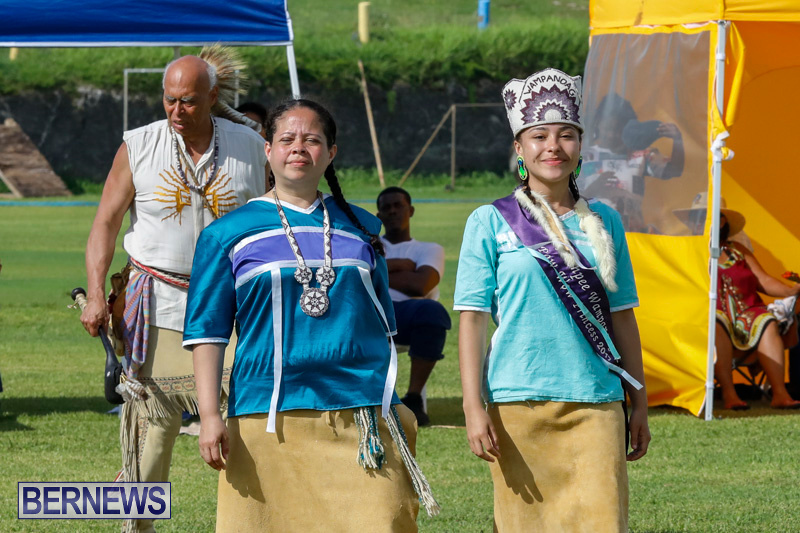 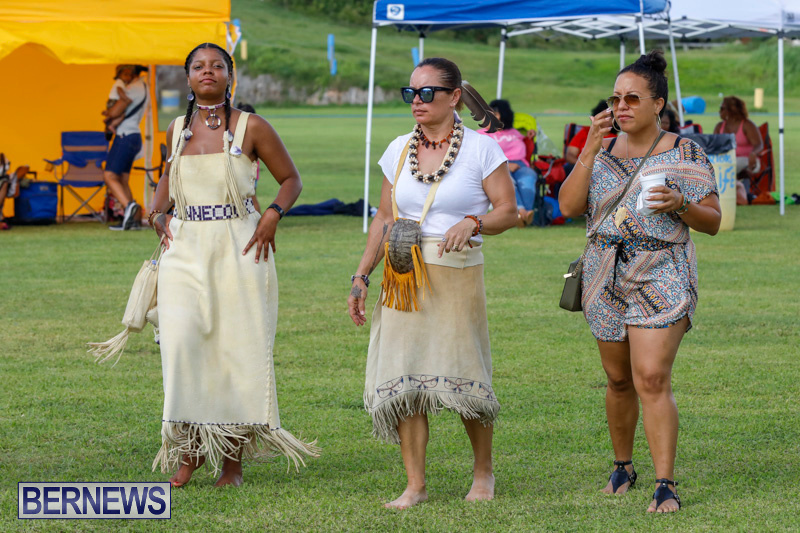 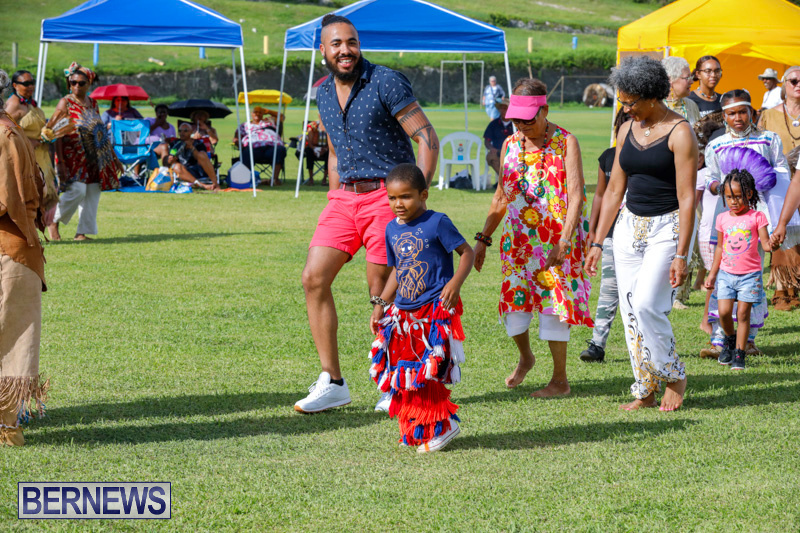 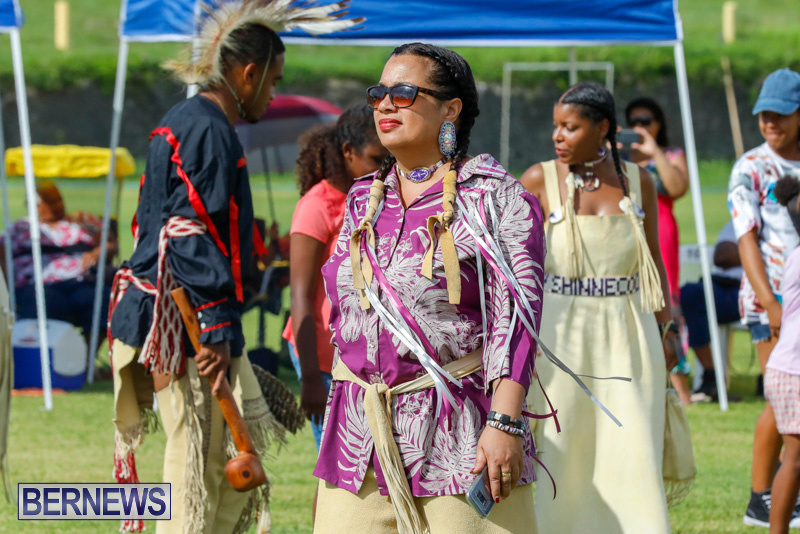 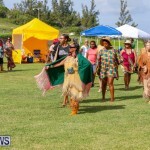 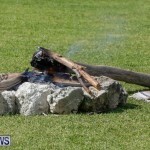 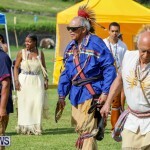 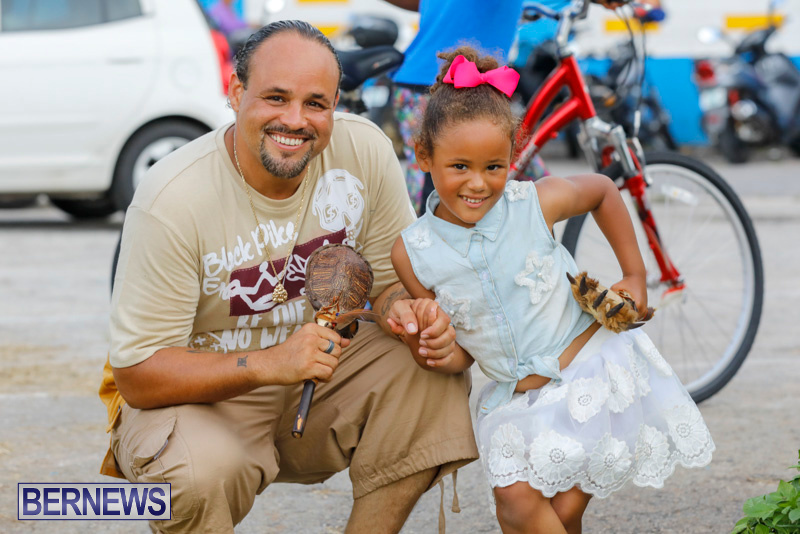 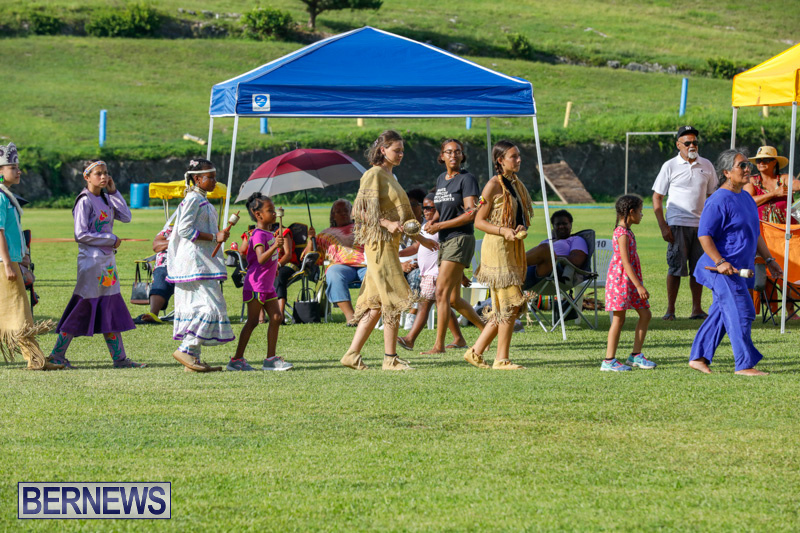 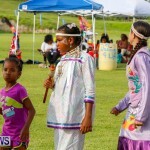 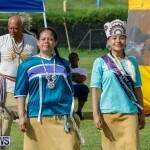 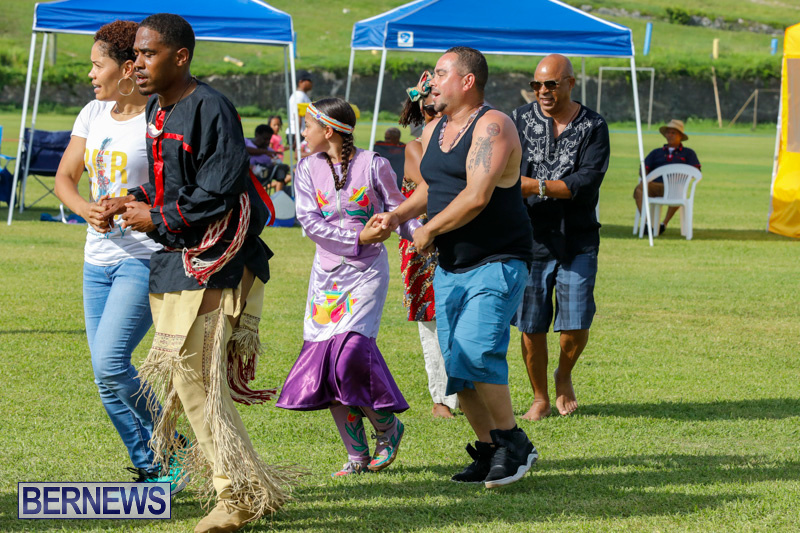 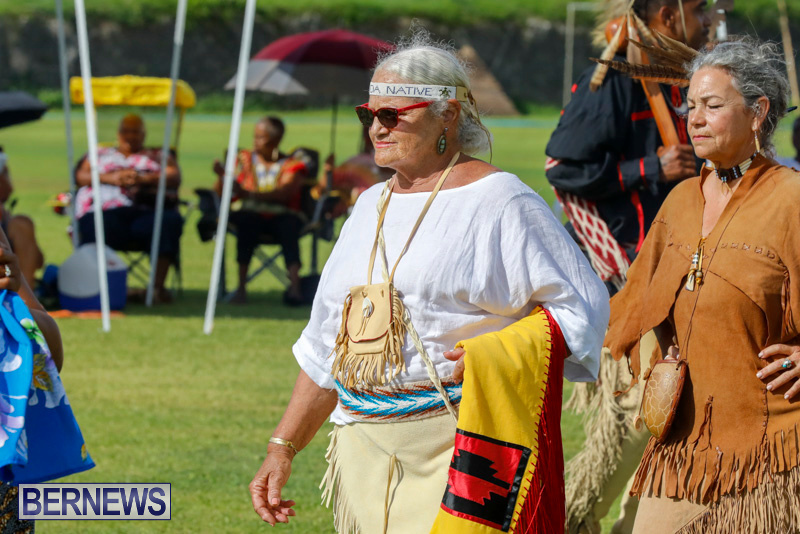 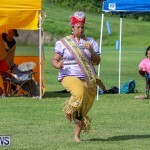 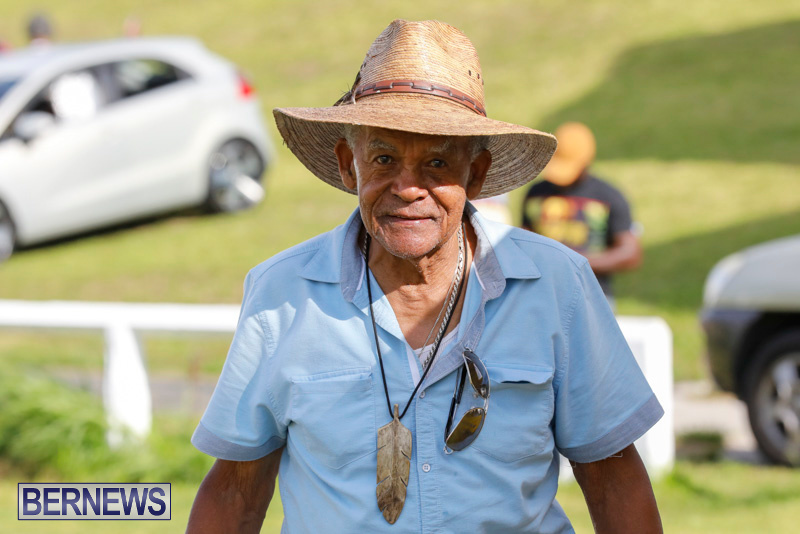 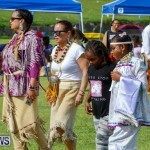 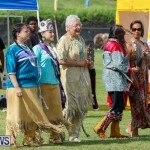 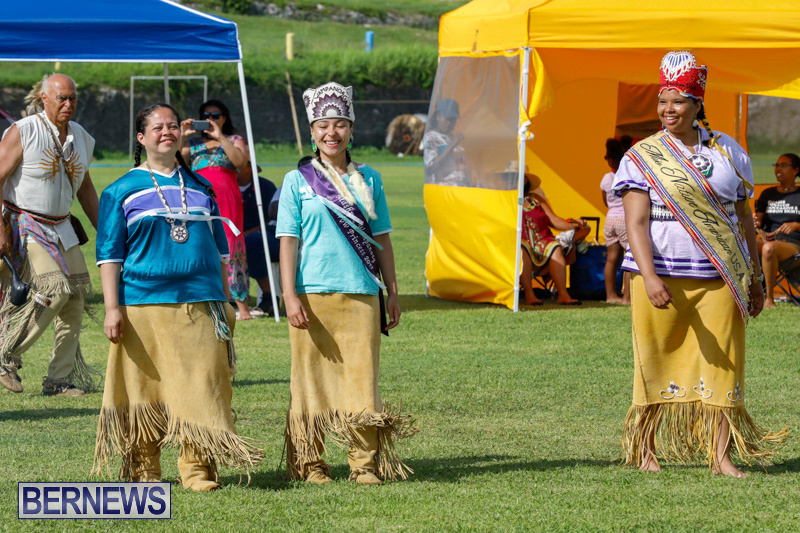 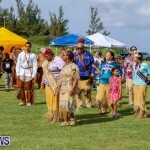 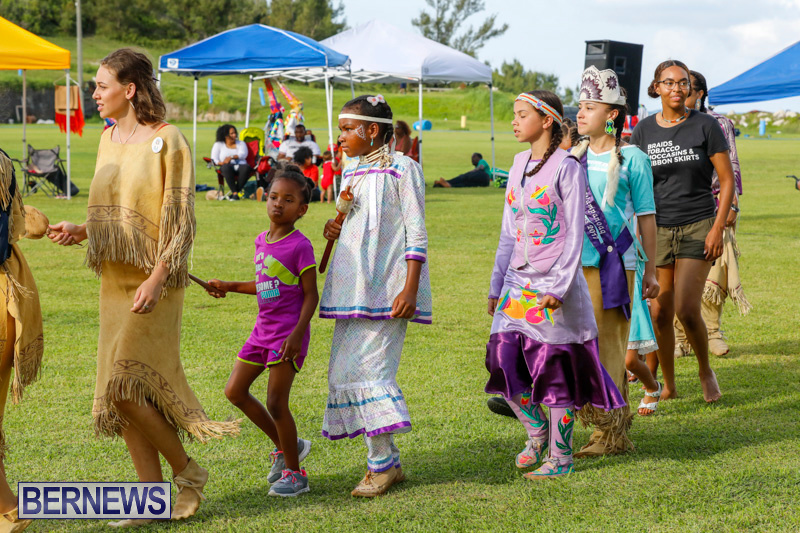 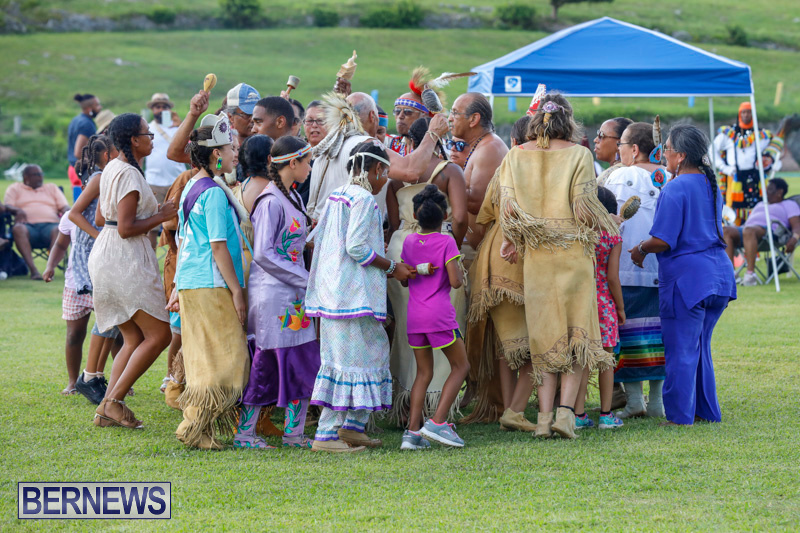 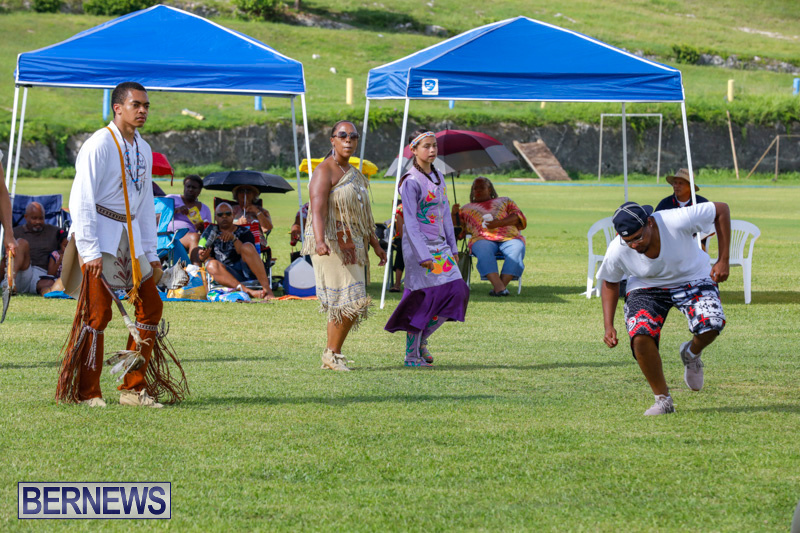 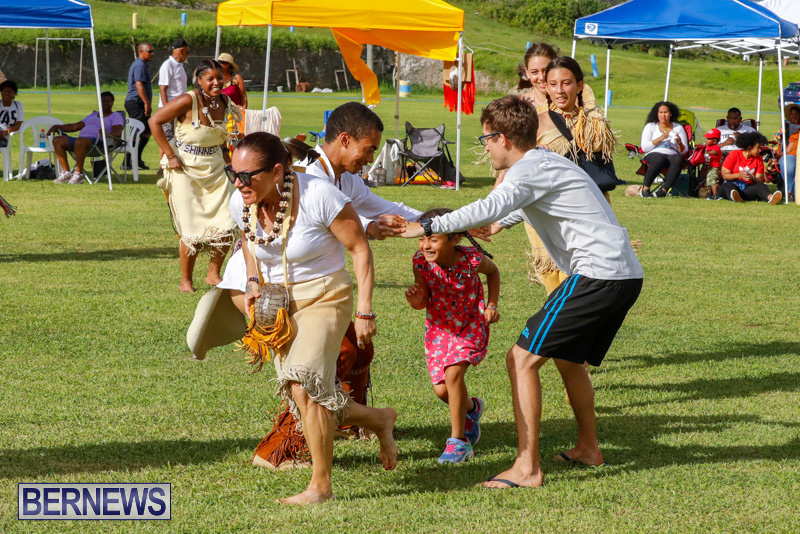 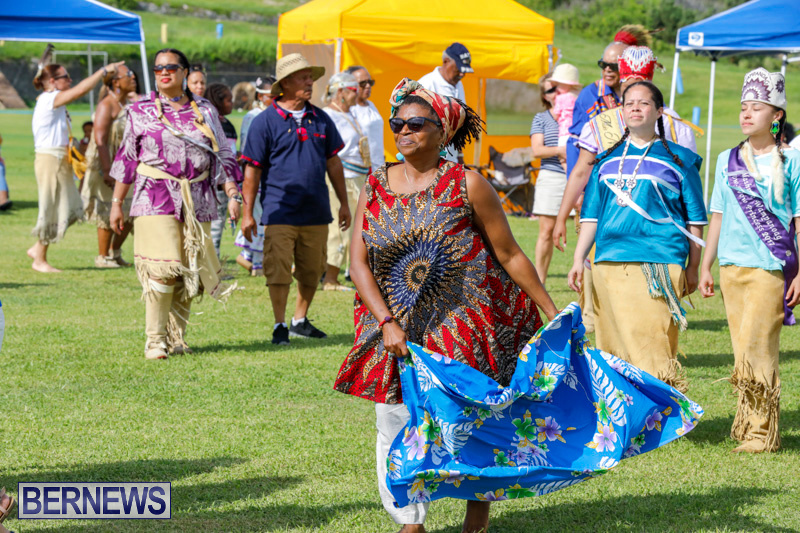 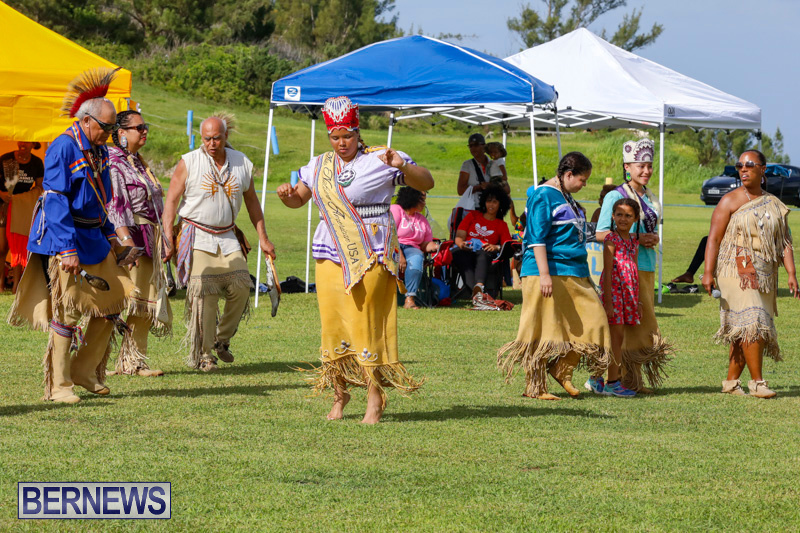 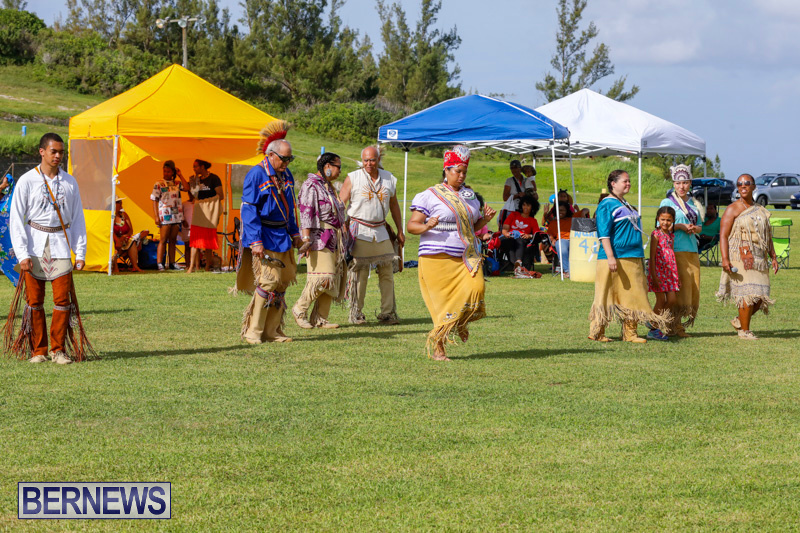 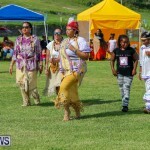 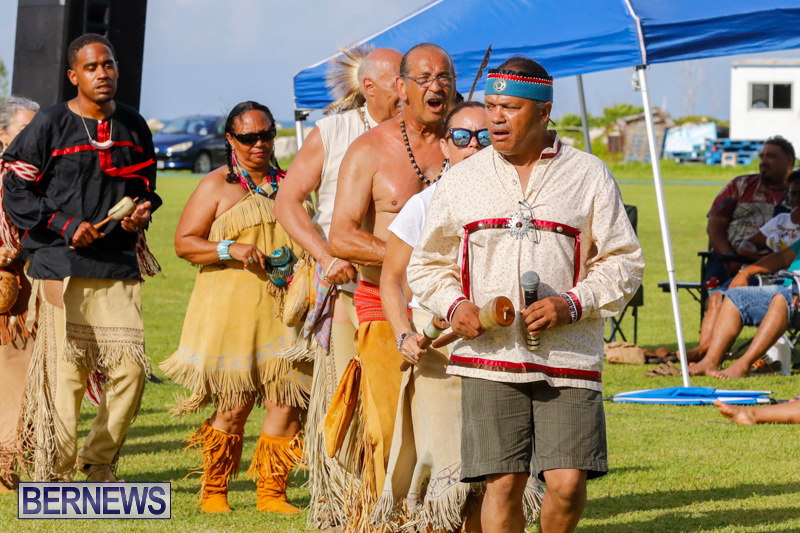 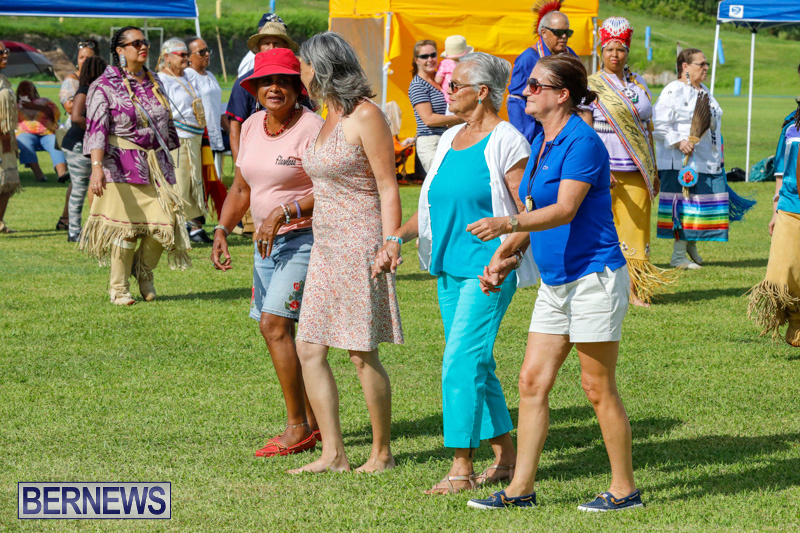 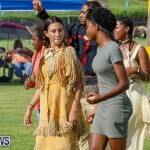 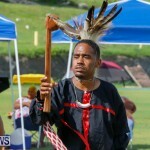 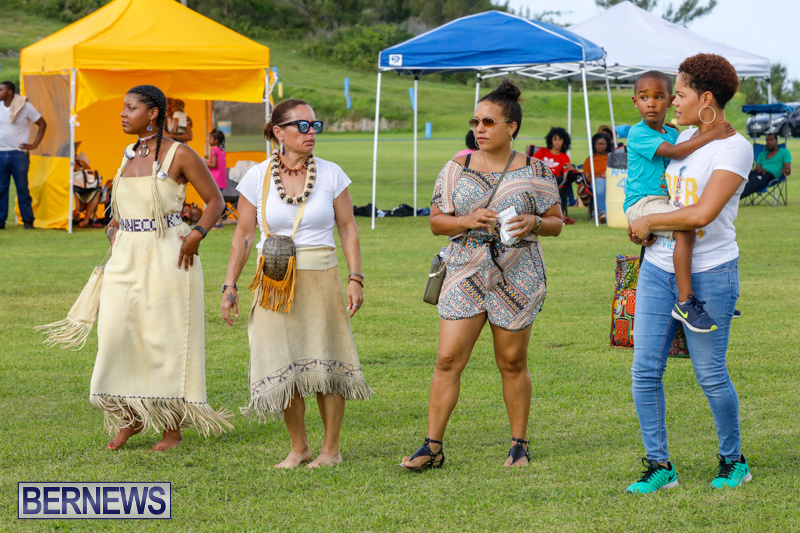 The St. David’s Islanders and Native Community hosted the Bermuda Pow Wow — “a celebration of our ancestors” — on June 9 and 10 at the St. David’s County Cricket Club Grounds. 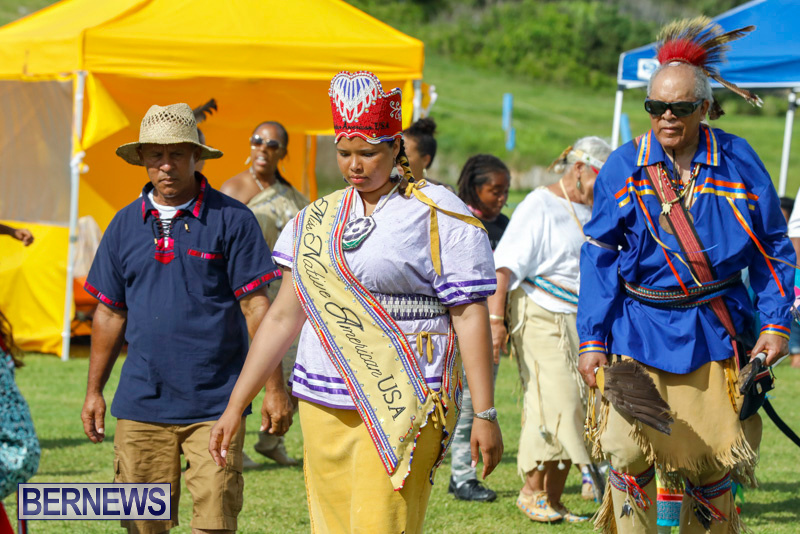 Both days of the event began with the Grand Entry which is a sacred procession that officially opens the Pow Wow, in which Tribal flags are carried followed by head dancers, tribal dignitaries, elders and the rest of the participants in order of regalia worn. 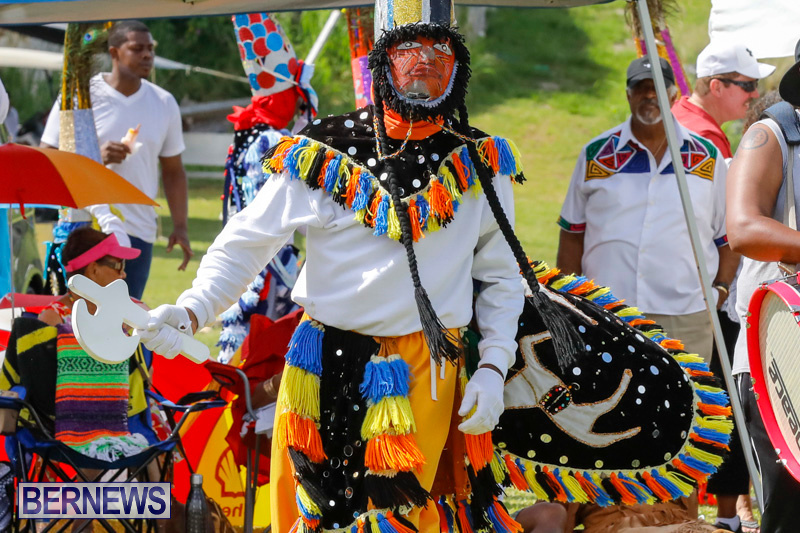 The event featured Inter-tribal, Social and Exhibition dances supported by Wakeby Lake and Storm Boyz Drummers along with the appearance of Warwick Gombeys. 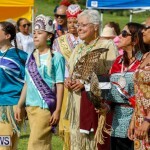 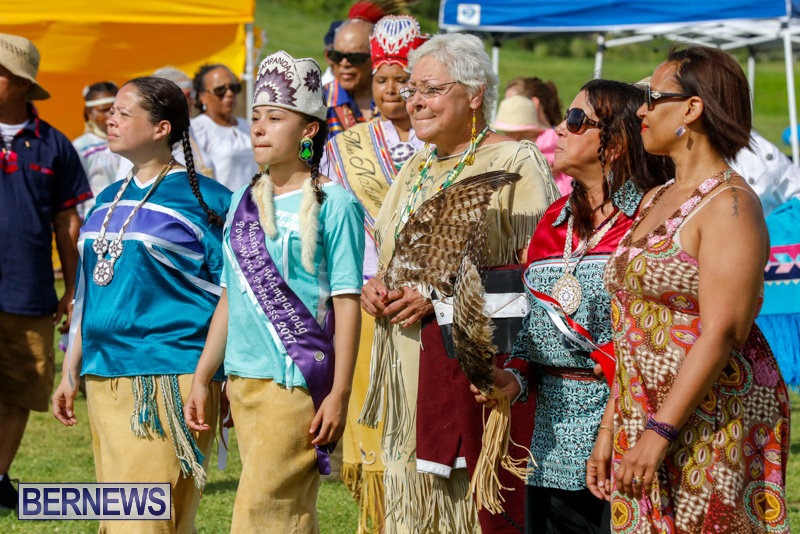 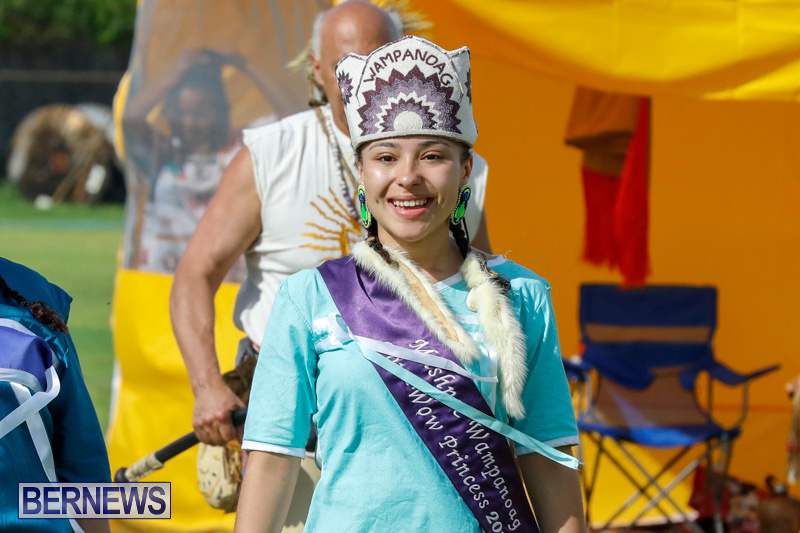 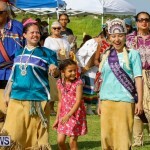 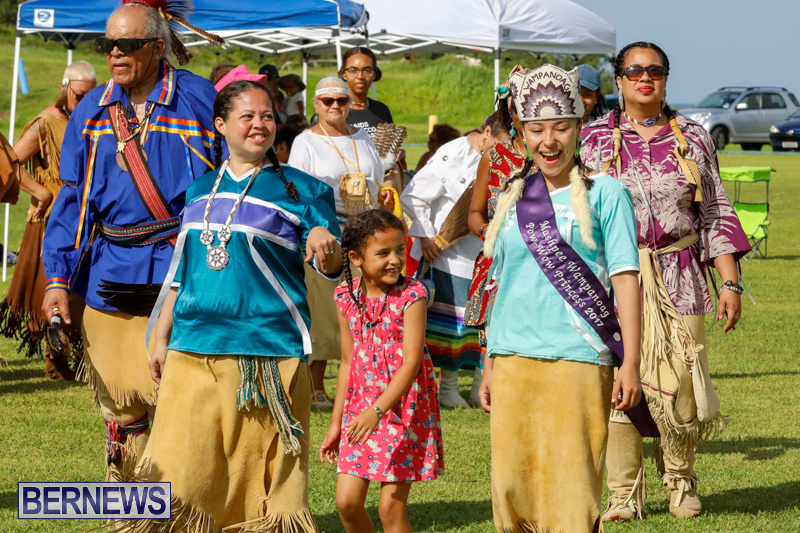 The Pow Wow welcomed reigning Miss Native American USA, Autumn Rose Miskweminanocsqua Williams and Mashpee Wampanoag Pow Wow Princess Chenoa Peters. 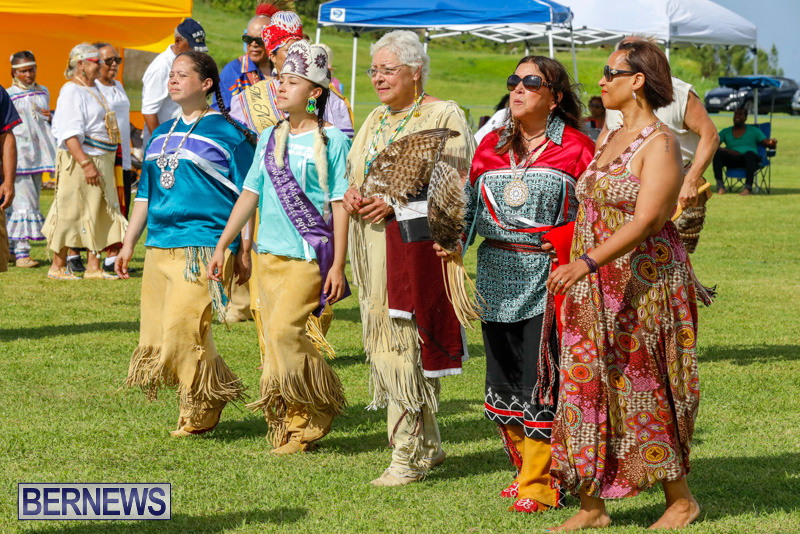 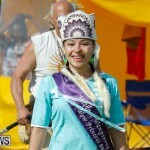 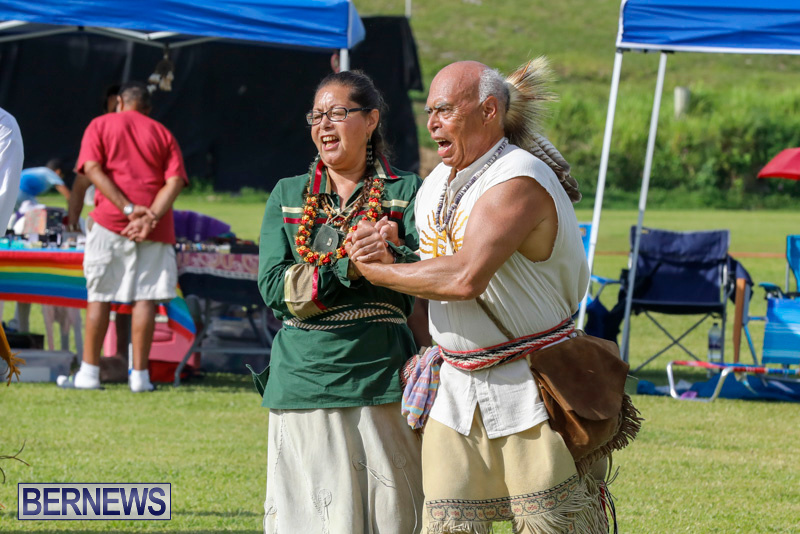 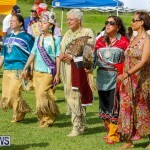 Click here for coverage from the first day and click here for all our Pow Wow coverage. 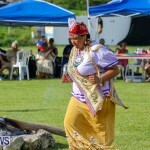 These are lovely pictures and it’s great they remember their Heritage. 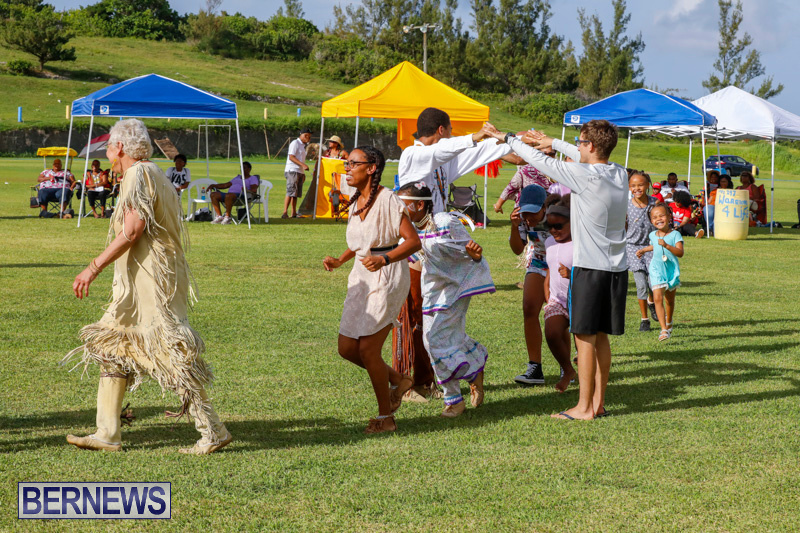 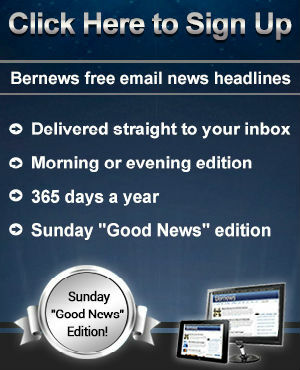 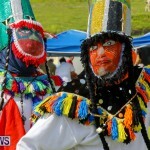 I was wondering as I looked at the photos (video) what do the other Bermudians celebrate as culture. 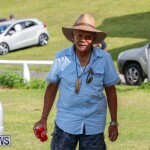 Everyone can’t be a gombey. 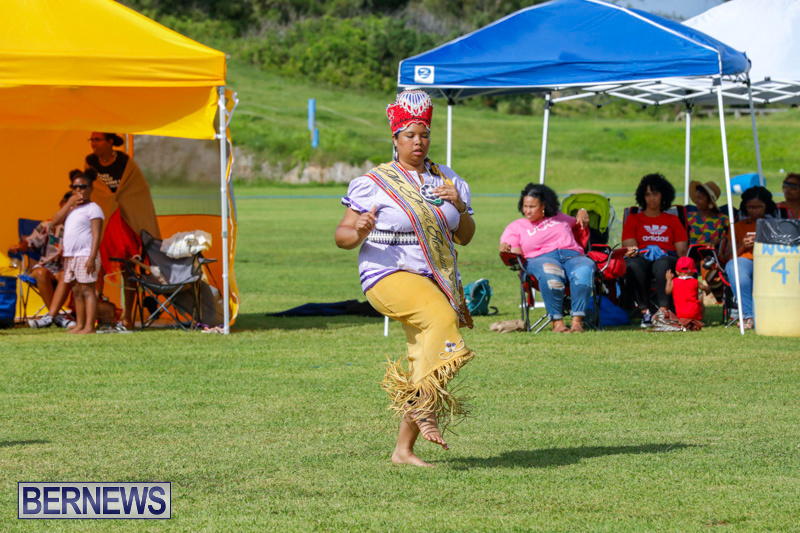 Where is our Heritage and why does the St. David’s islanders not take part in the Bermuda Heritage Day, aren’t they Bermudians too!